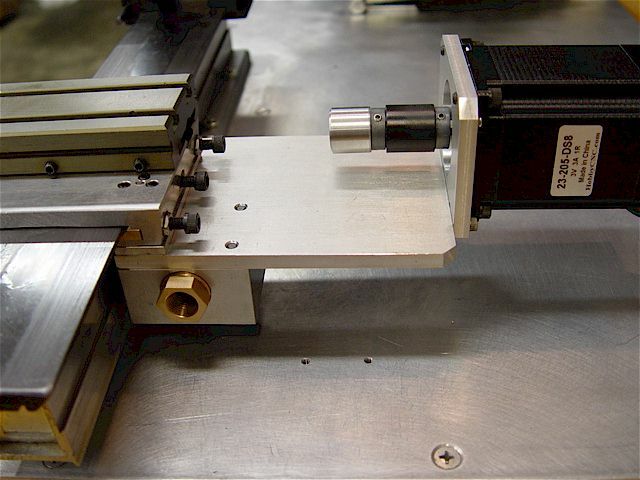 Taig Micro Lathe converted to CNC. 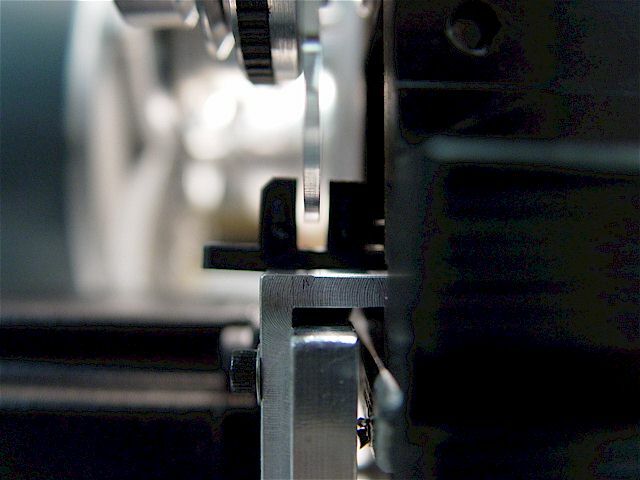 Photo shows cutting first taper without a compound. 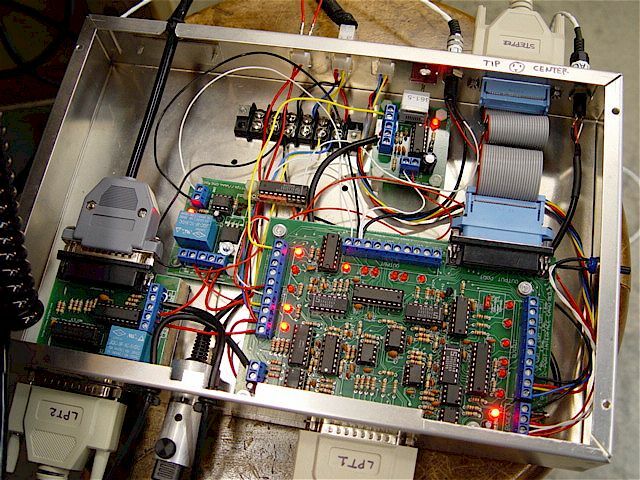 control panel was easily redesigned & rewired to provide switchable X & Z axes outputs. 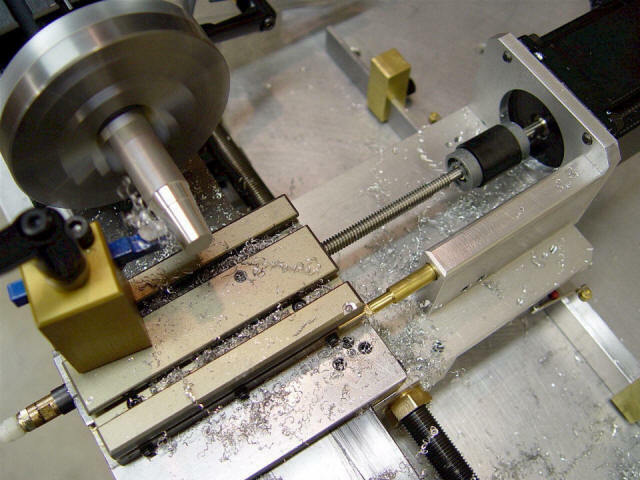 Back to baseline lathe configuration. Mounted on a 1/8" aluminum plate. Three, 6-32 screws hold the motor mounting plate. 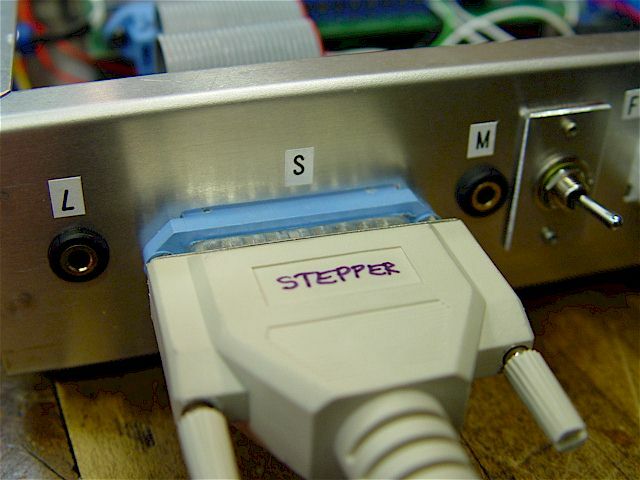 The stepper is held on with four, 10-32 cap-head bolts. 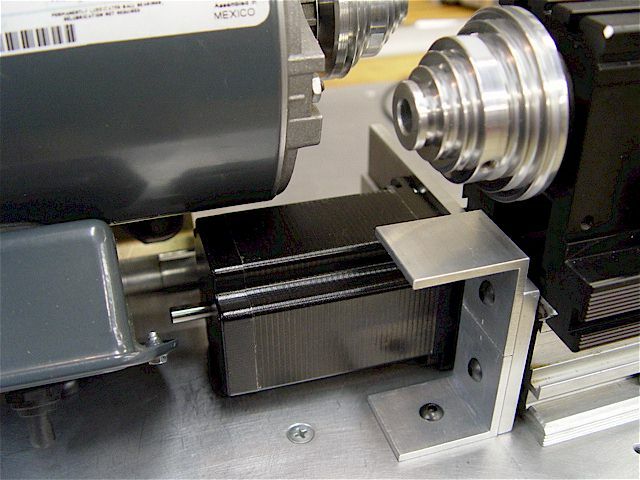 The motor has a 1.5" diameter lip that fits into & centers on the NEMA 23 dimensioned motor bracket hole. 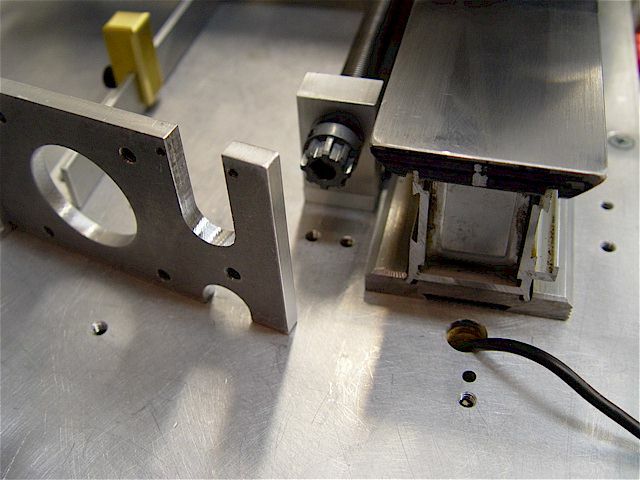 Initial bracket design using 1/4" aluminum plate. 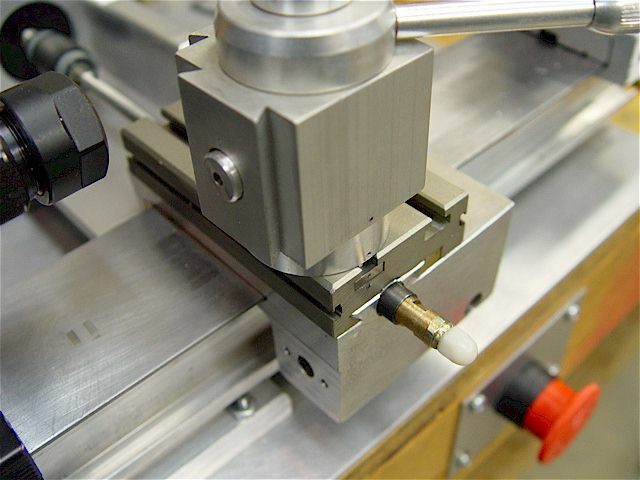 A transfer punch aided alignment. 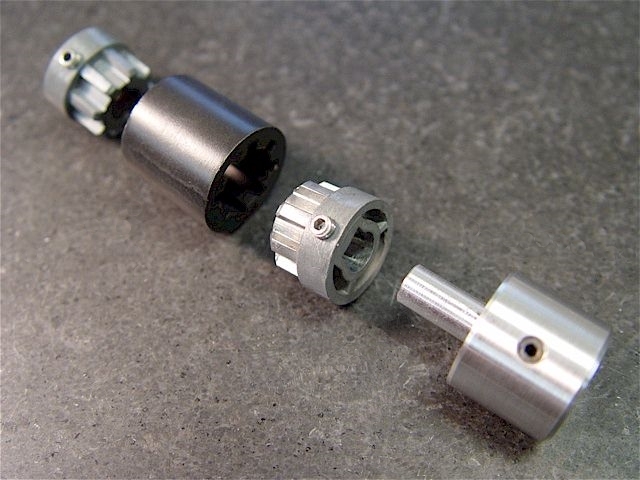 Exploded view of the zero-backlash spline-shaft coupler with fabricated 1/4-20 LH lead screw adapter. Zero-backlash shaft coupler assembled. A second, simpler adapter was also made. threads were enlarged to 8-32 for increased strength. Do not over clamp these bolts as it will affect the gib. Changed the coupler to use a simple shaft size adapter (cylinder) with a hole for the set screw to past through. 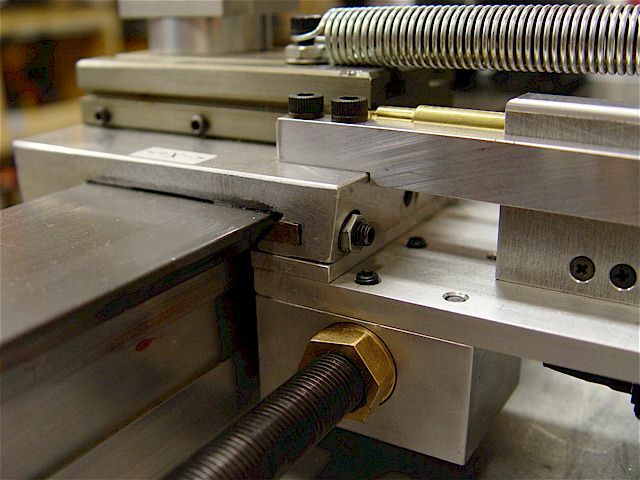 tightening/loosening the lock nut on the other end where the bronze radial/thrust bearings are located. 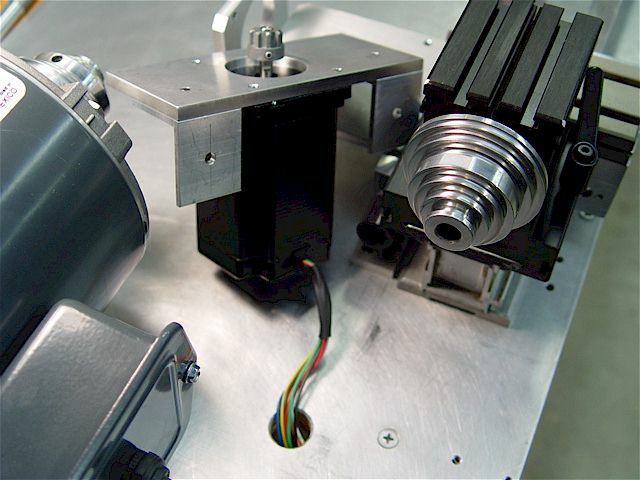 Since the stepper motors do not have thrust bearings, it is best to isolate them from those forces. forces though this is quite unlikely as the front thrust bearing has all but eliminated any movement. 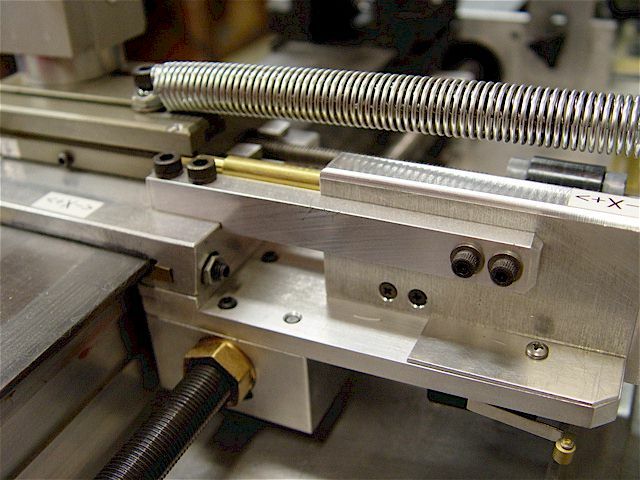 The same precaution is taken for the Z-axis lead screw coupler, too. Radial & thrust bearings are made out of oil-impregnated sintered bronze (OISB). It threads into the original location. 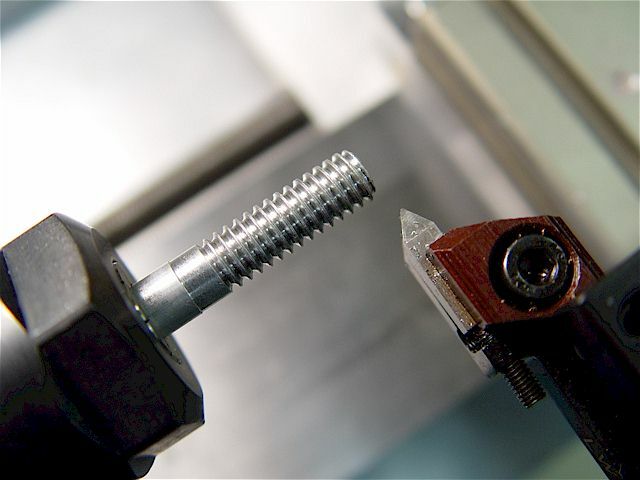 The lead screw was made of 1/4-20 SS LH threaded rod. OEM geometry was replicated but to tighter tolerances. Note, oil-impregnated bronze is soft & can crush/distort. Exploded view of thrust-bearing assembly. The left & right ends of the body act as thrust-bearing surfaces. 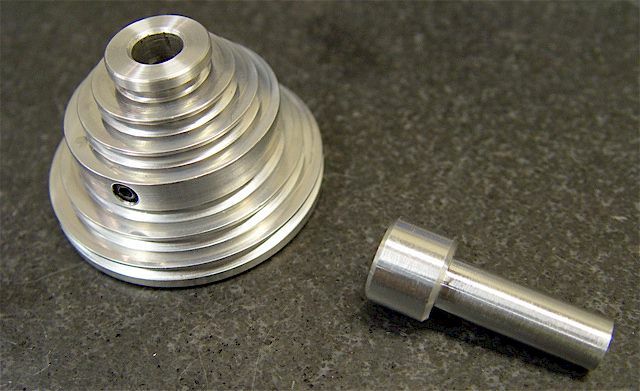 The body (0.711" OAL) has a 5/16-24 NF thread & 0.462" length that are the same as the OEM part. 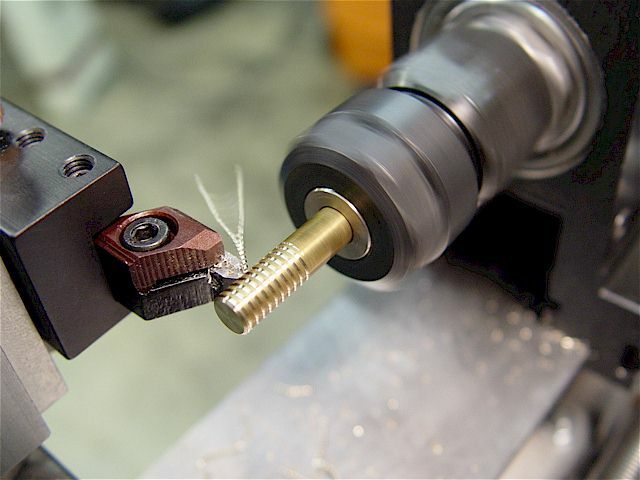 Machined & cut a 0.42" long 6-32 thread on the lead-screw end. The unthreaded shaft is 0.82" long. 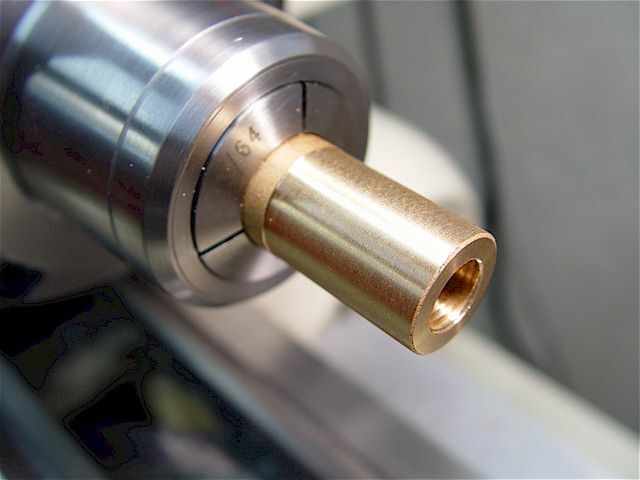 The shaft is 1.24" OAL x 0.14125" diameter. 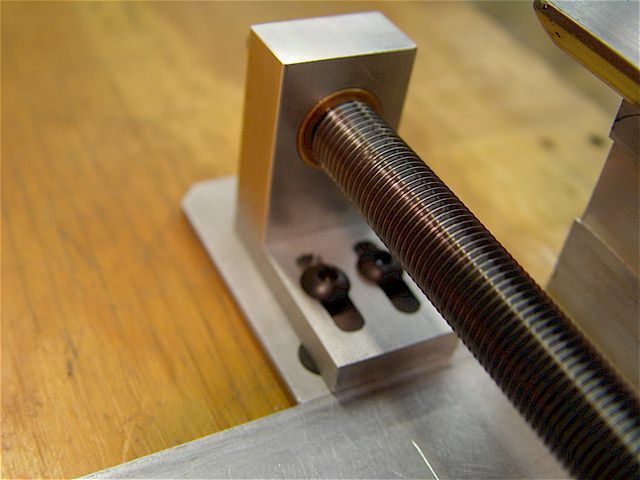 The lead screw is machined square/flat & bears directly against the (right) side of the thrust bearing. The black-colored steel collar is a retained OEM part. 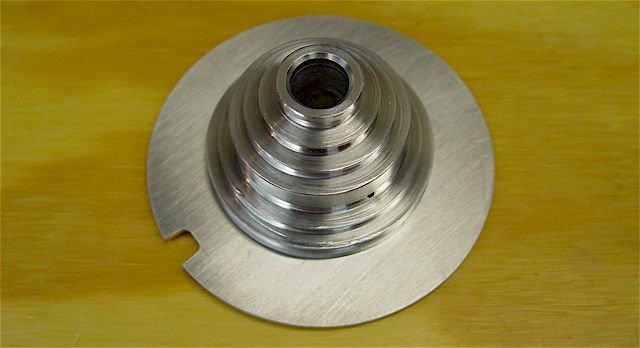 A 0.32" diameter x 0.128" thick OISB thrust washer is on the (left) side of the bearing. Locknut is adjusted until there is no play or binding. 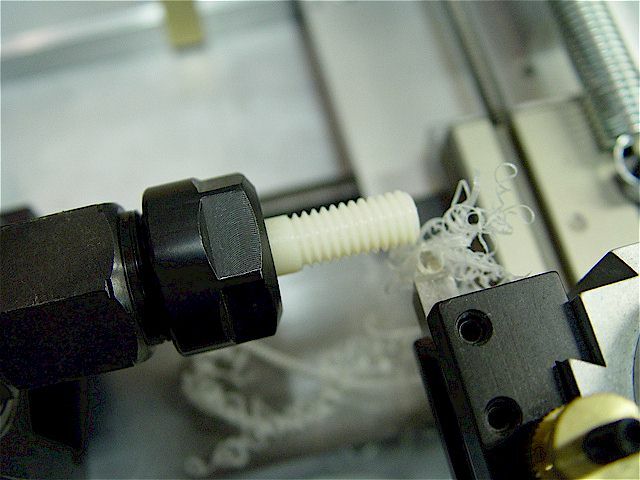 A nylon acorn nut locks the first nut & covers the sharp threads. 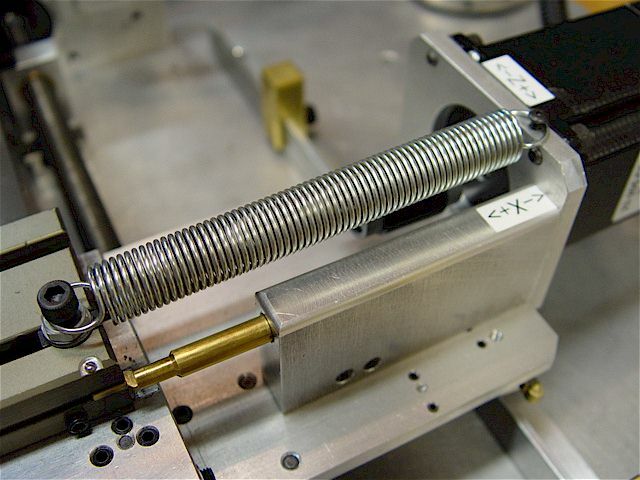 Added a spring to further reduce any backlash at the lead-screw nut. 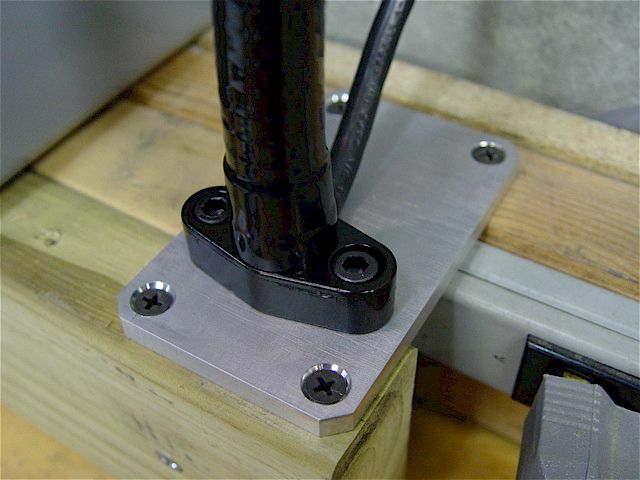 The adjustable left bracket uses a T-nut, washer, nut & 10-32 bolt. 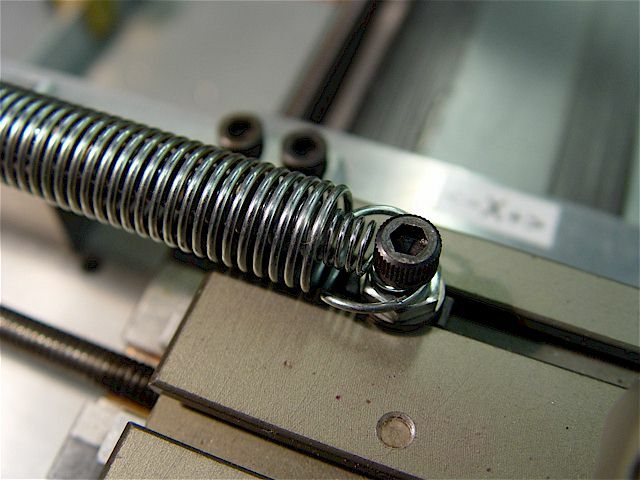 The spring does not affect the bracket geometry. 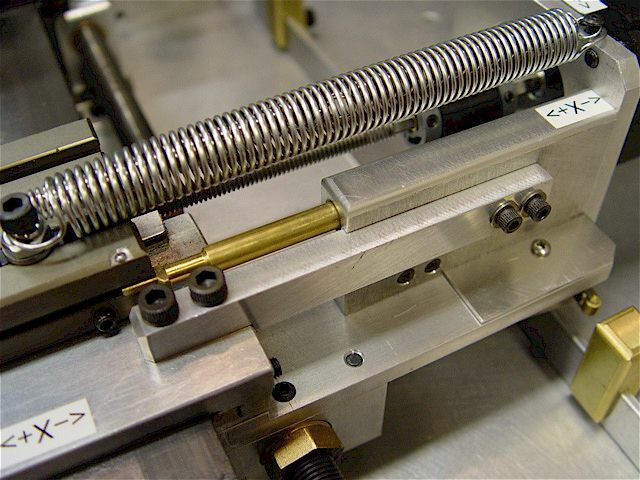 Added a second inner spring. 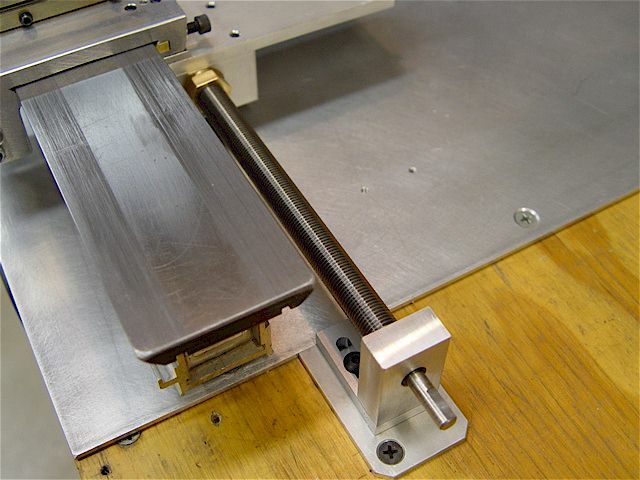 Added an upper stiffening bracket for the X-axis stepper motor. 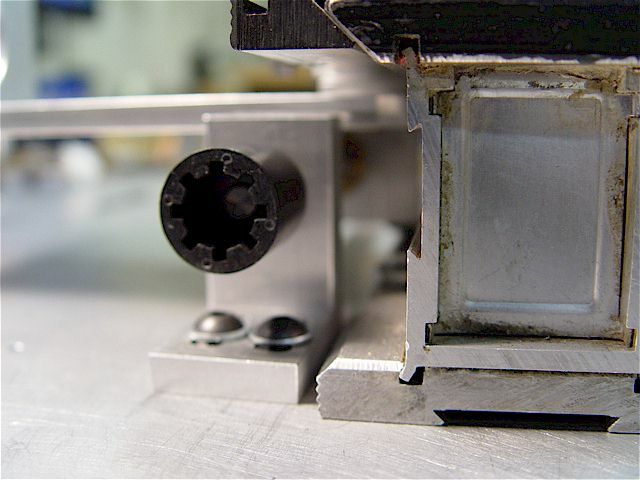 The left edge is chamfered to clear the cam. The part bolts to the carriage & the limit switch housing. It has two notches that engage the mating parts' edges. The two right bolts had to clear the cam channel located just above. They screw into tapped blind holes. 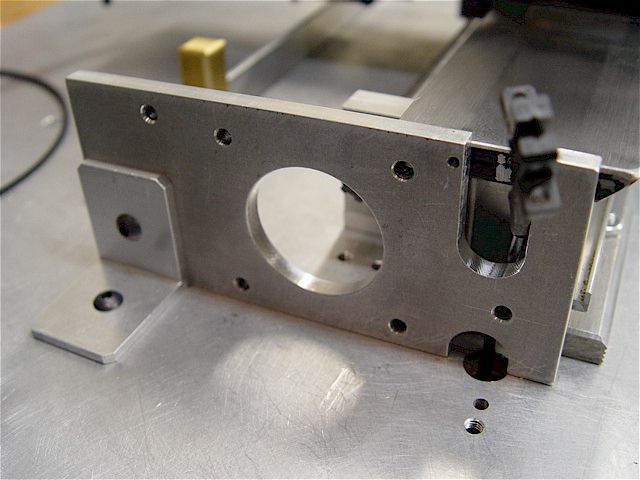 Another view of the engaged bracket notch. 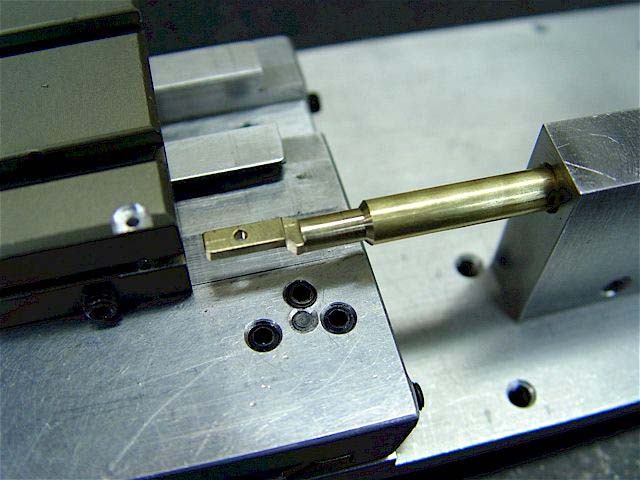 Precision reaming a 1/4" hole in a block to accept the two, oil-impregnated bronze lead-screw nuts. 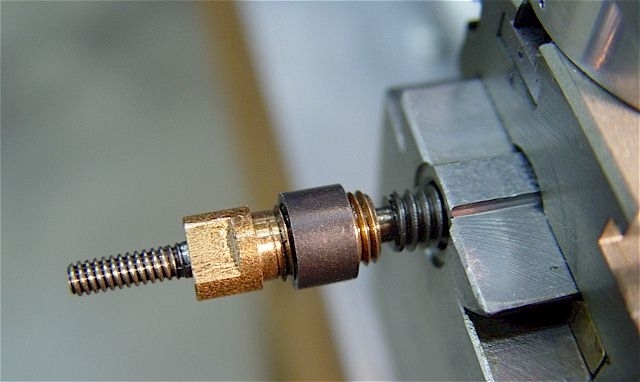 Bronze oil-impregnated bearing material threaded for the 1/4-20 RH precision lead screw. 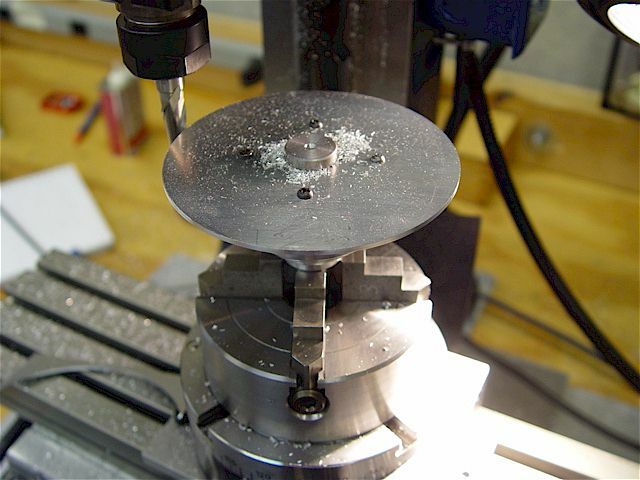 Outside diameter of the lead screw nuts machined to 0.750" & cut apart. 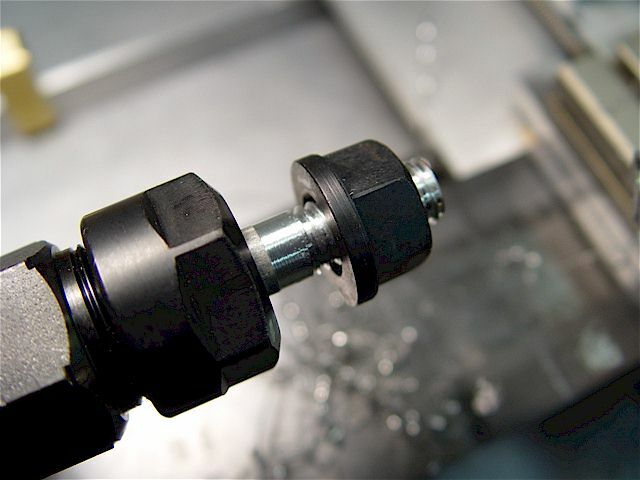 Extra material was left to make the hex nut for wrench adjustments. 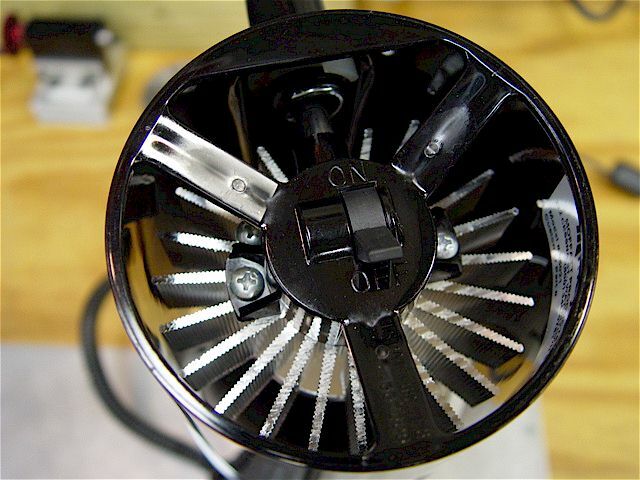 Exploded view of the lead screw nut housing as well as the bottom of the motor bracket screws. 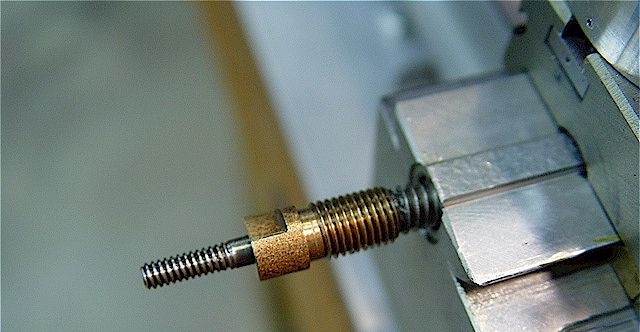 Note the square groove in the lead-screw nuts & the half-dog point set screws that engage them. The lead screw bearing block is held to the underside of the motor bracket using four, 10-32 cap-head bolts. 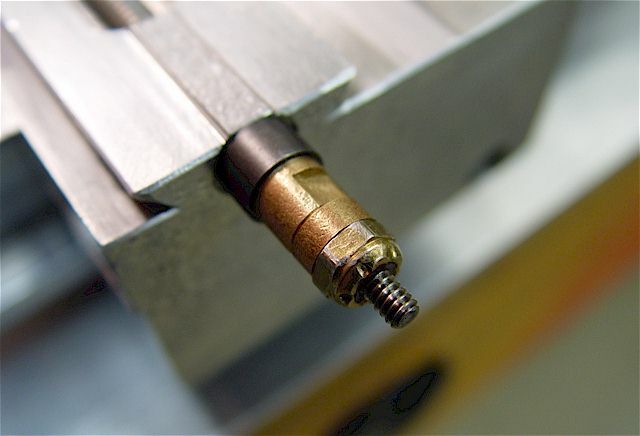 The backlash is removed by adjusting one nut against the other. The hex nut is 11/16". 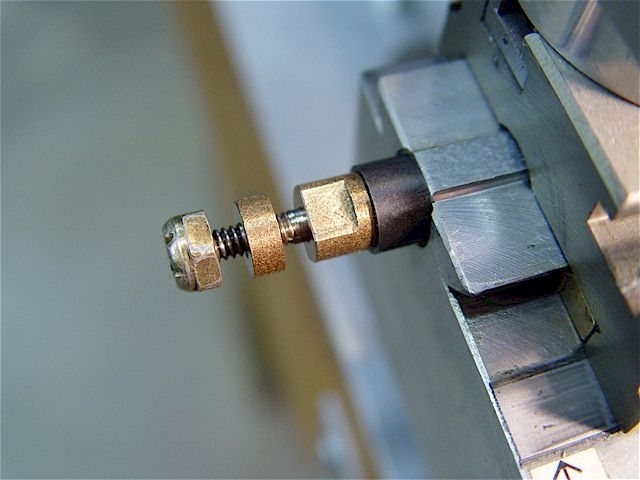 The small hole, in-between the two right bolts, allows access to the 6-32 cap-head bracket bolt. Two more similar set screws were added on the top to add strength & hold the settings, better. 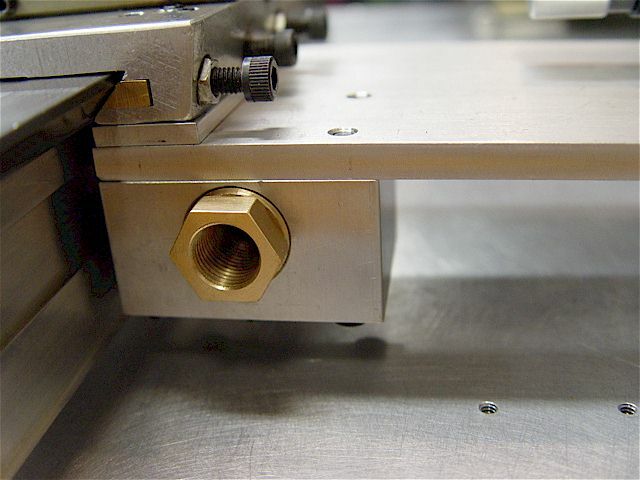 The Z-axis lead screw nut housing is tucked-up as close to the lathe bed, as possible. The spacer aligned the lead screw & motor axes. Not the strongest setup so a Stiffening Bracket was added for greatly increased strength. 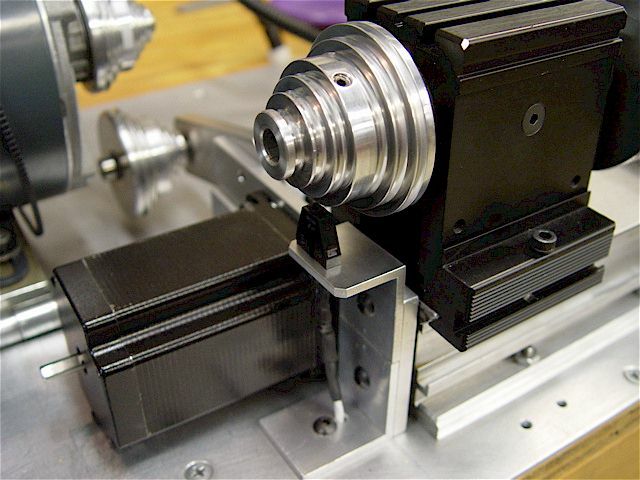 The larger stepper motor is for the carriage & the medium-sized motor is for the cross slide; both are 3A. 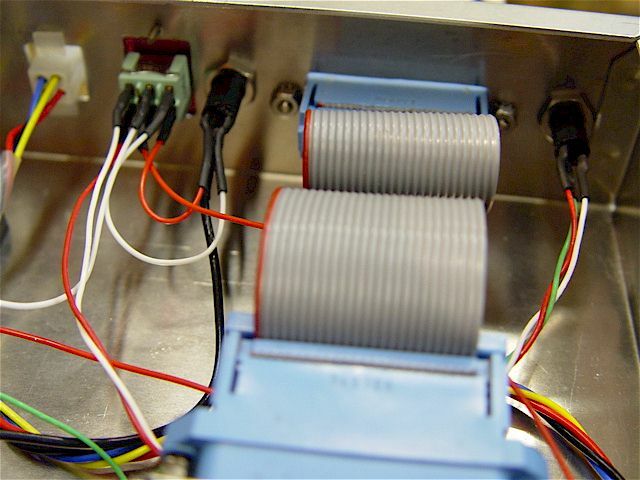 The eight motor leads are wired into the six-pin, Molex socket. The 7' long cables use 18 gage wire. 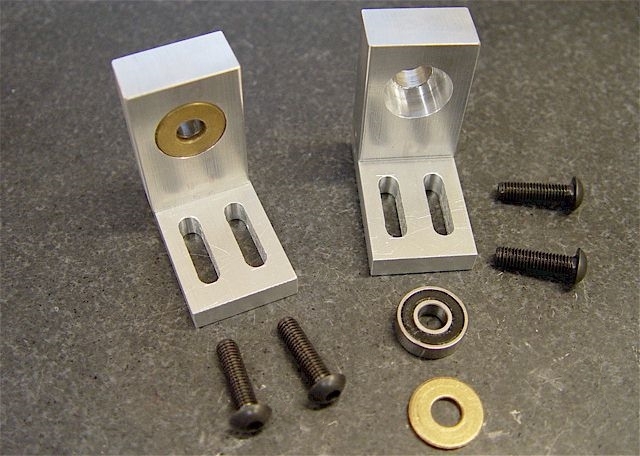 Lead-screw brackets with 5/8" OD, 1/2" ID radial ball & oil-impregnated bronze thrust bearings. so the bronze thrust washers were added to the design. 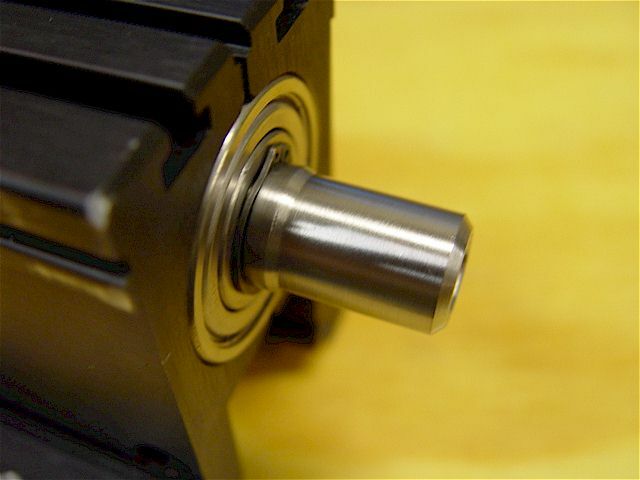 counter bore to give the radial bearing's hub clearance during rotation. A 1/2" hole through the bench top allows the motor connector & cable to completely be hidden underneath. 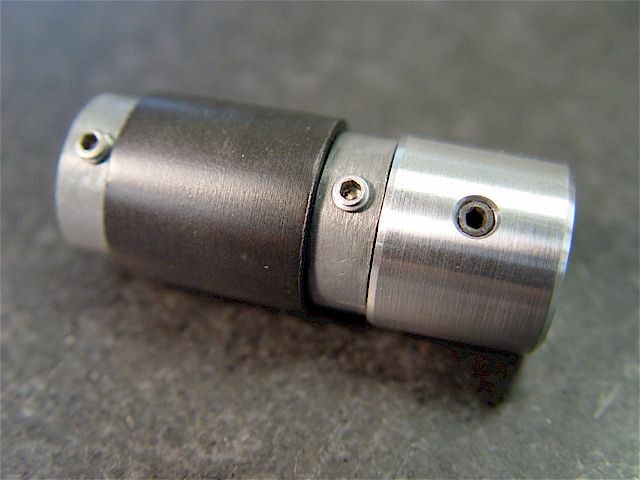 End of the lead-screw spline-style shaft coupler with one side removed. A bronze washer (hidden) acts as a leftward thrust (carriage moves right) bearing surface. 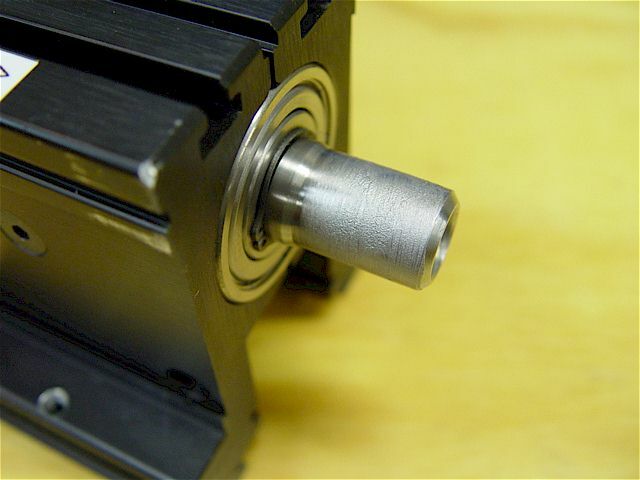 Z-axis lead-screw motor fits into a close-tolerance, 1.5" counter-bore hole for the NEMA 23 mount. speeds & a spindle tachometer pickup under the spindle pulley, respectively. 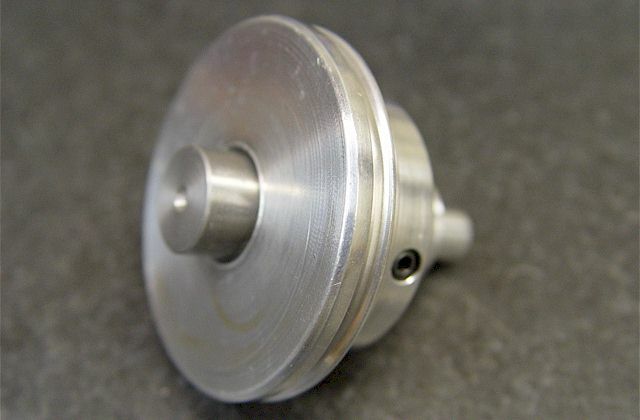 A compact jackshaft (or countershaft) 3rd pulley system for 178 RPM; handy for CNC threading. Rotated the lead-screw bracket 180 deg to allow better access to the lock-down bolts with a ball hex wrench. For under the screw heads, made a steel spacer bar; much better than washers which distorted over the slot. 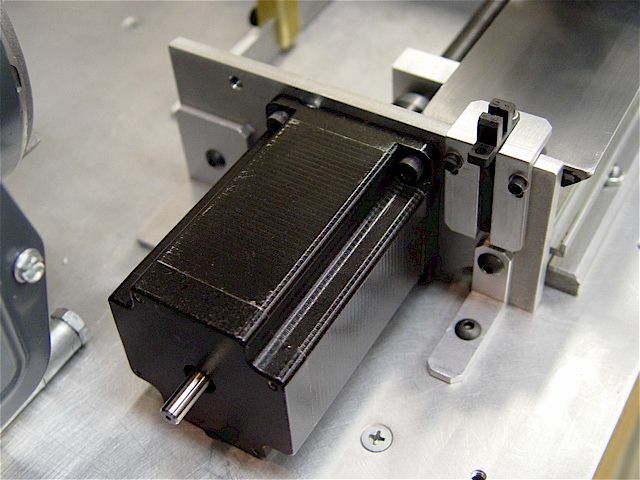 The stepper motor is in full contact with the metal top plate providing additional, effective heat dissipation. 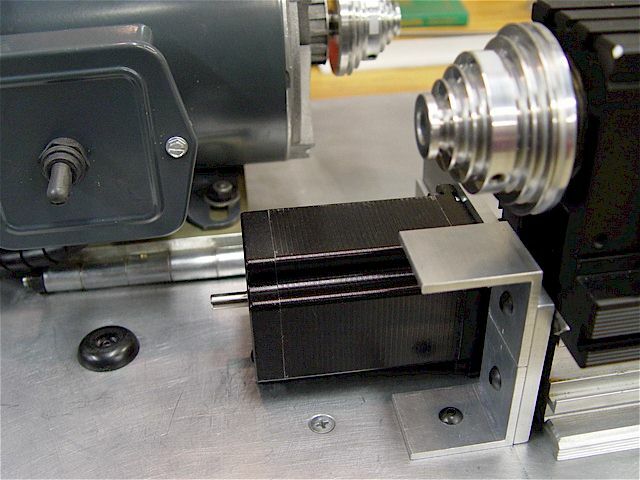 When the spindle motor is tilted forward, it now rests against a rubber bumper. 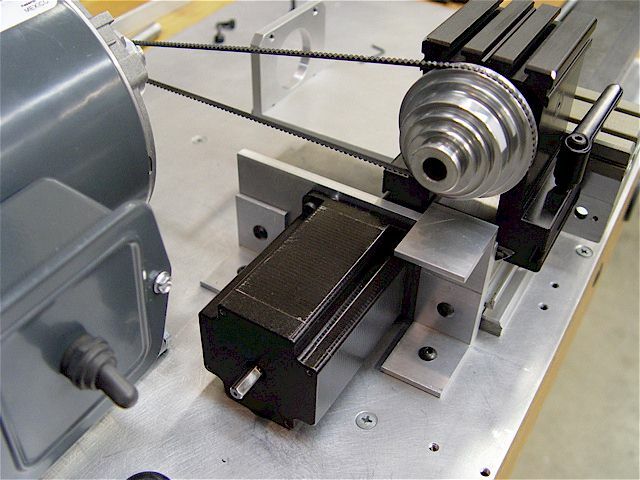 All parts clear each other when the spindle motor is tilted forward to change the belt on the pulleys. 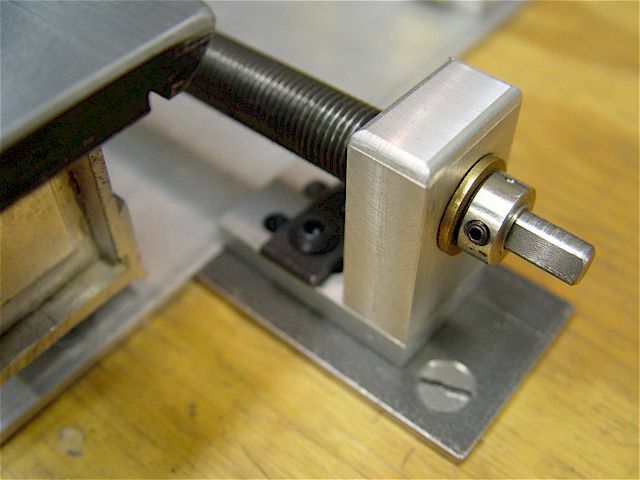 Radial/thrust bearing & bracket mounted at the other end of the lead screw. 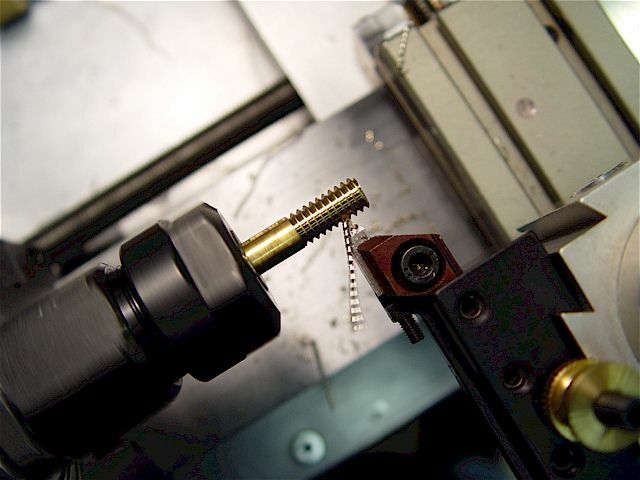 The precision 1/2-20 lead screw is a spare part leftover from the Taig Micro Mill CNC conversion project. A bronze, oil-impregnated washer acts as a rightward thrust (carriage moves left) bearing surface. Changed the sub-plate to 1/8" steel so the threads would be stronger. Its mounting bolts pass through the bench top. Added another oil-impregnated bronze thrust washer with locking collar for additional strength. DRO-350, it required a tachometer/buffer circuit buffer circuit to achieve reliable Mach3 readings. 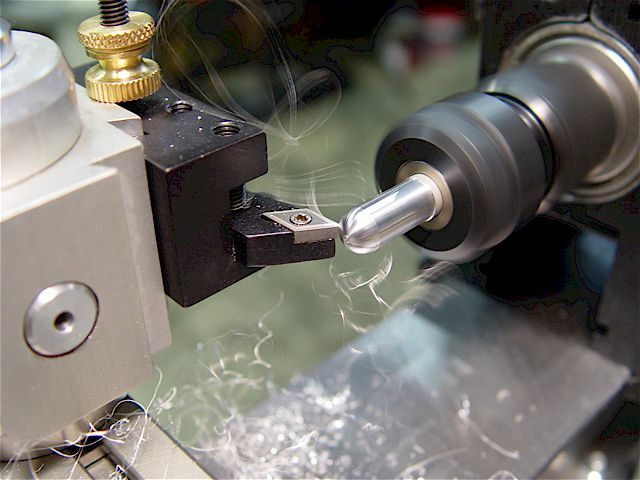 for the CNC lathe spindle but is still being used for the CNC mill spindle tachometer pick-up circuit. 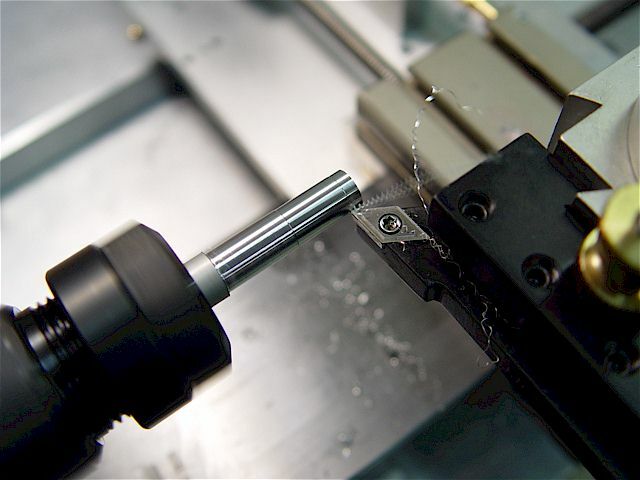 The QRB1114 is secured using a tapered pin that rests in a shallow channel cut with a 1/8" ball-nose end mill. Made a slot to the rear to allow the pick-up to slide in & out for ease of installation. The tachometer pick-up senses the dark set screw passing by. The set screw was painted black. 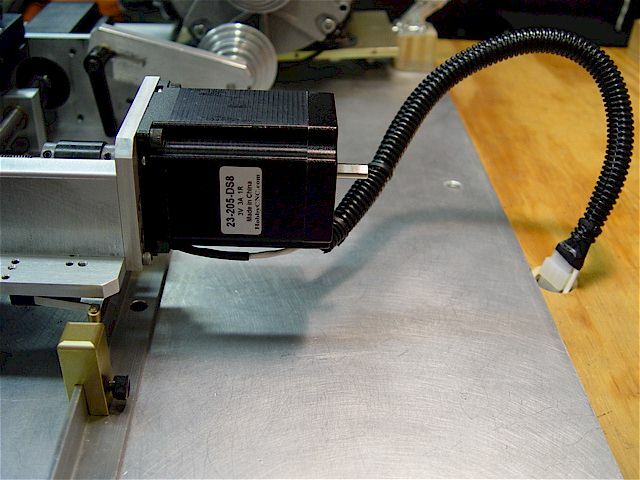 The Teflon-coated, two-conductor wire is routed under the bench along with the stepper & limit switch cables. 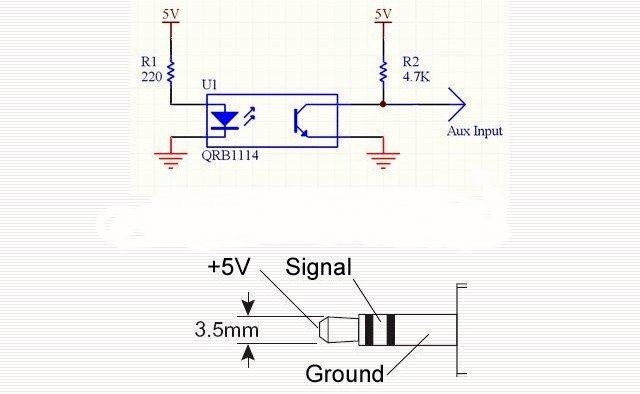 Mill & lathe tachometer inputs to Mach3 are switched analogous to the stepper motor output switching circuit. Direction of the micro-switch level points to which mini-stereo input jack is connected to the breakout board. Only the tachometer signal (white) & 5VDC (red) are switched. The two grounds are tied together at the board. 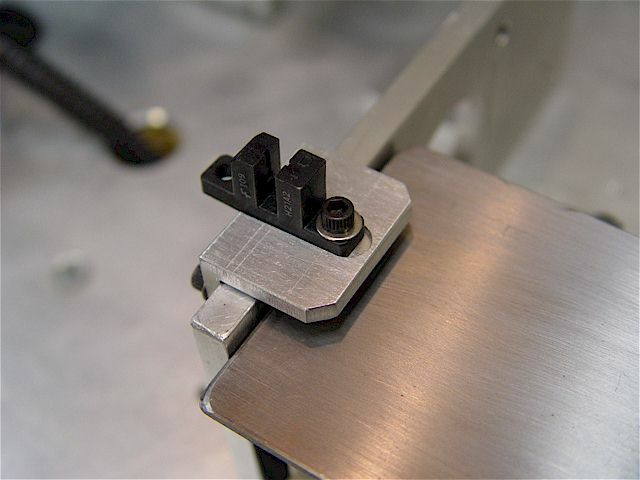 This switched sensor approach has been changed to accommodate a slotted-disk type index for the lathe. 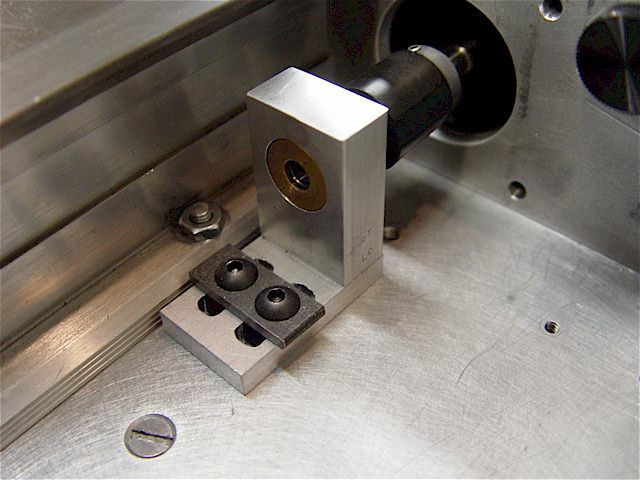 The switch is no longer necessary as the mill & lathe tachometers now use separate input channels. The reflective tachometer sufficed for RPM indication but l wanted more precision for CNC threading. 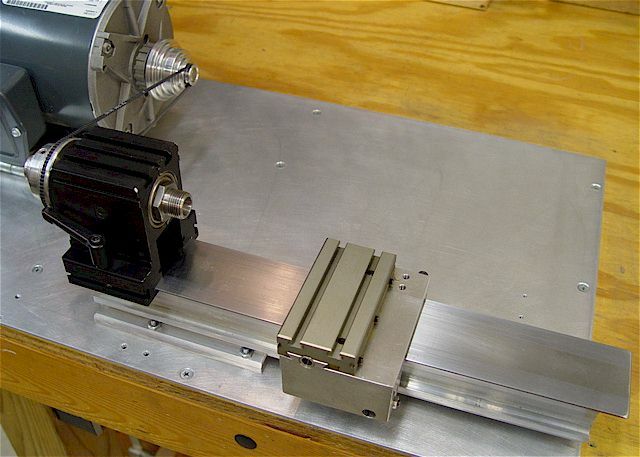 The 4-jaw chuck & the CNC rotary table were mounted onto the Taig mill bed for manual control via Mach3. 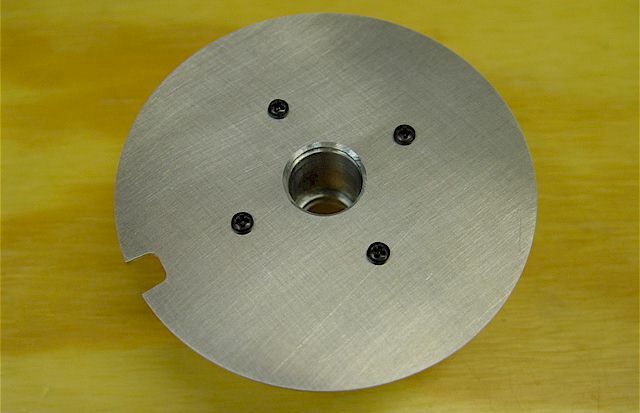 To fabricate & mount a slotted disk, first a 1/2"-3/8" stepped arbor was made to hold the Taig pulley in the 4-jaw. 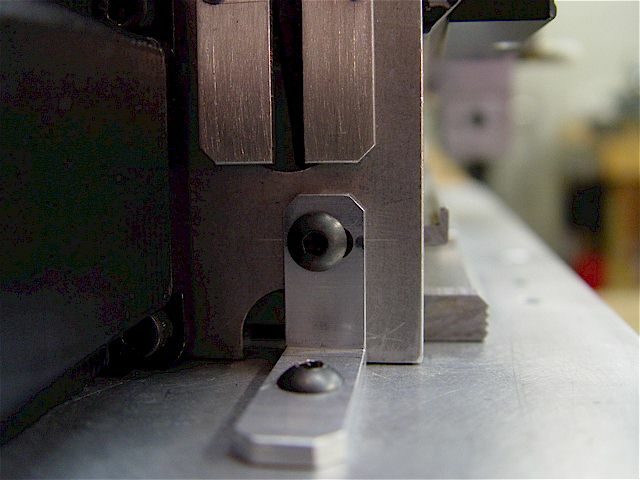 A removable, 5/8" steel peg is shown in place. 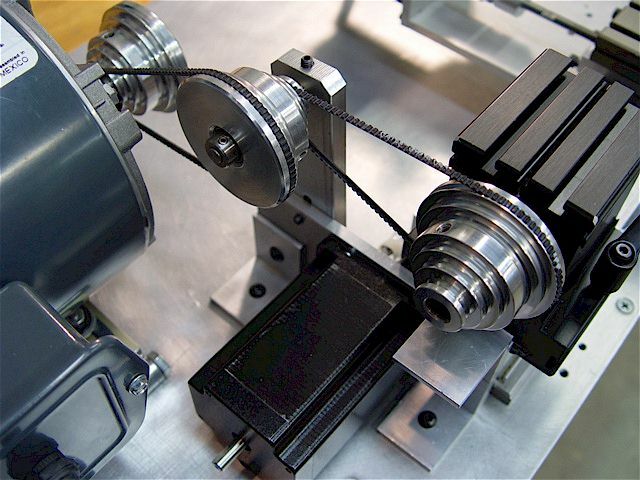 The pulley shown being trammed true in the 4-jaw chuck. 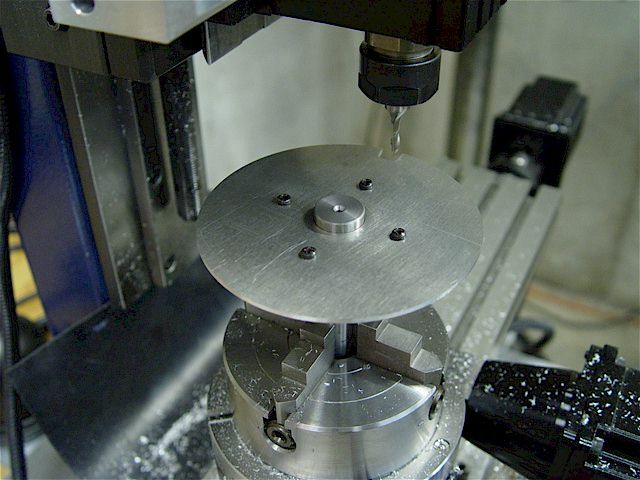 A 5/8" peg centers the 0.0625" thick aluminum plate & 1/2" deep, #43 holes are drilled every 90 degrees. 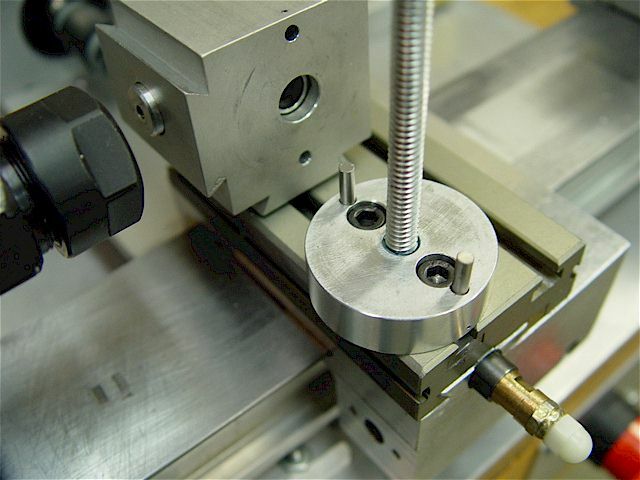 Tapping & installing a 4-40 screw after each hole helped make the setup increasingly rigid. 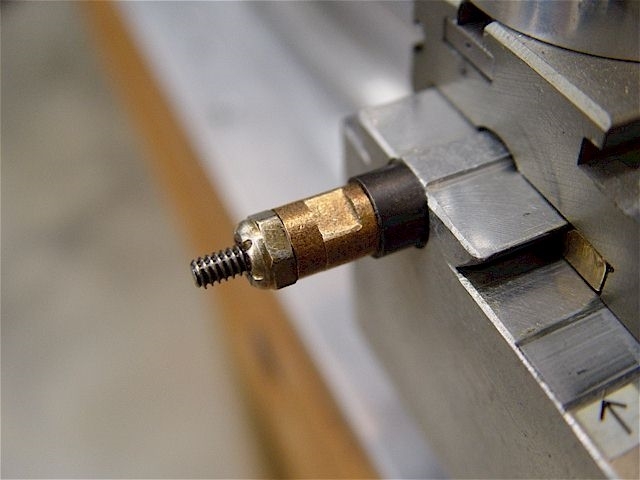 The 5/8" center peg is removed in-between each 4-40 tapping. 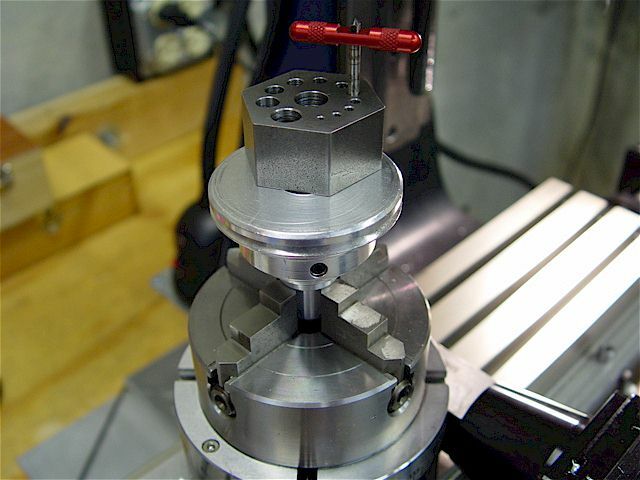 With the center peg & 4 screws in place, a 3.5" diameter disk is milled using a series of deeper cuts. The indexing notch was milled to a size as calculated using these formulae from Mach3's documentation. 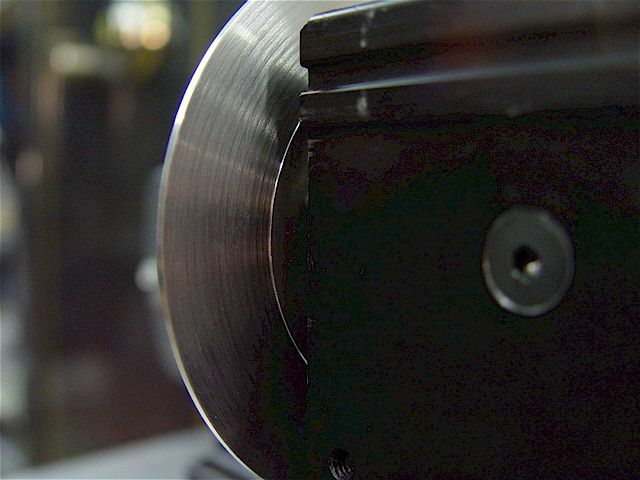 This square-edged, 0.25" deep by 0.32" wide slot is slightly oversized for the maximum speed of 8200 RPM. Mach3 no longer supports multi-slot timing. Note: If D is in inches (or mm) then W is in inches (or mm). 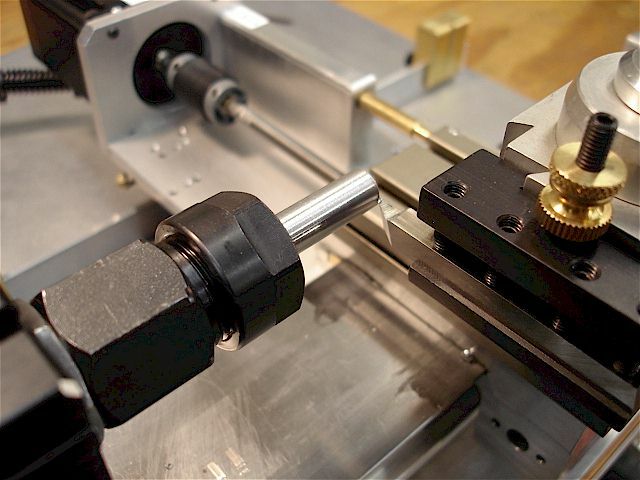 The center has a countersink to clear the spindle hub properly. 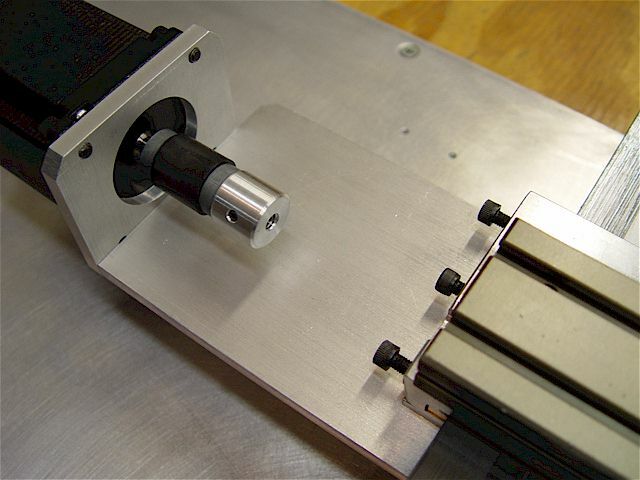 Slotted disk fully mounted onto the pulley. Aluminum anti-seizing compound was applied before installing the heat-expanded pulley. For one slot, set the indexing parameters of LPT1 & the pin input #. 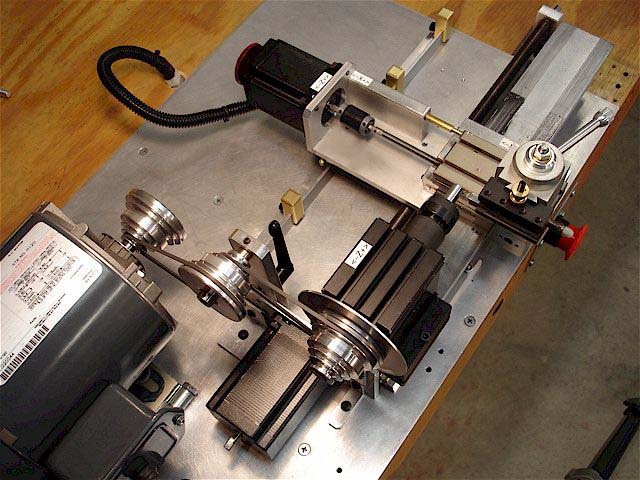 This CNC setup uses LPT1 pin 15 input for the lathe & LPT1 pin 11 input for the mill. See the system schematic. in the front/back/edge surfaces of the disk were removed. The disk runout is now minimized. 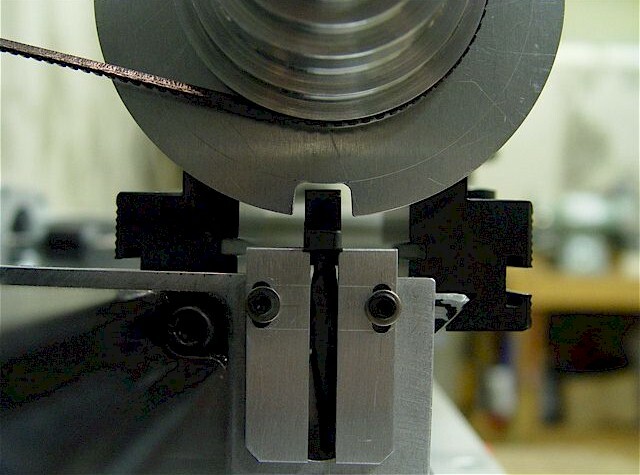 All edges were carefully deburred to reduce the chances of cuts while it is rotating at high speed. 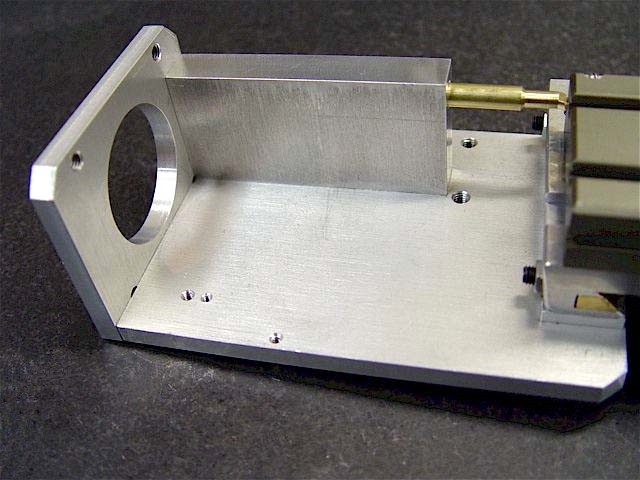 A large hole through the mounting plate allows the mini-stereo jack & wire to be fed through the bench top. 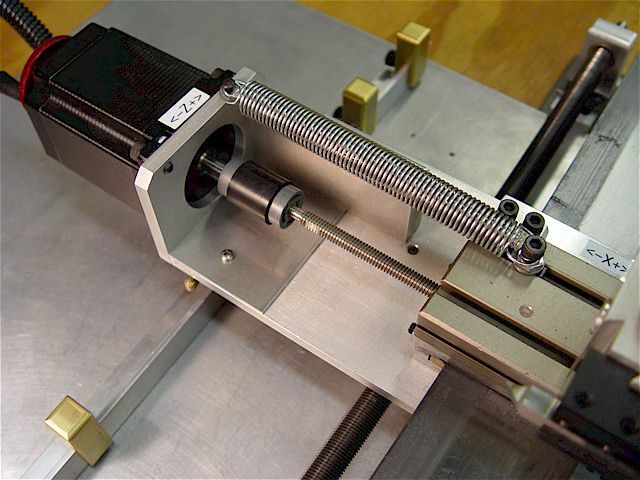 The Z-axis stepper motor bracket had to have several areas opened-up for the tachometer pick-up wire. 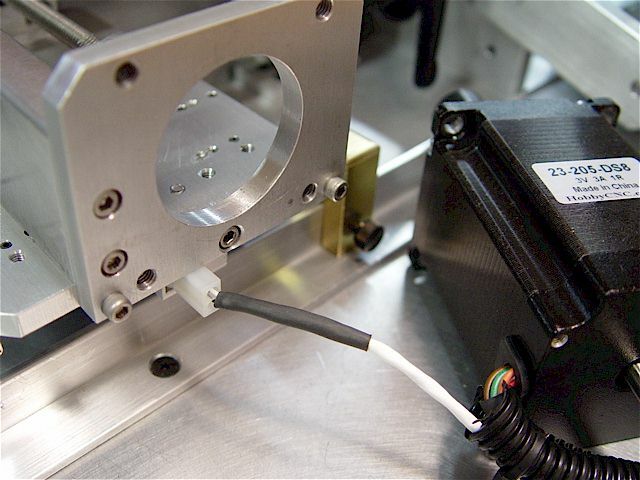 The NTE 3100 photon-coupled interrupter module bracket allows access for the wire to slip into place. Note the vertical adjustment capability afforded by the slotted bracket with two 4-40 screws with SS washers. 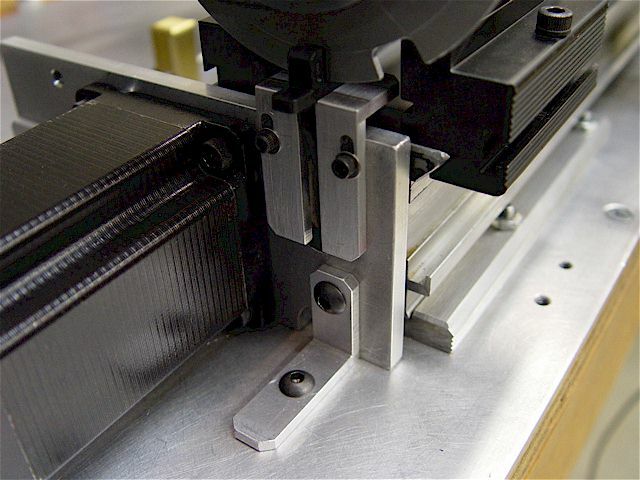 A shallow recess is milled into the top to keep the module from turning after prolong exposure to vibration. 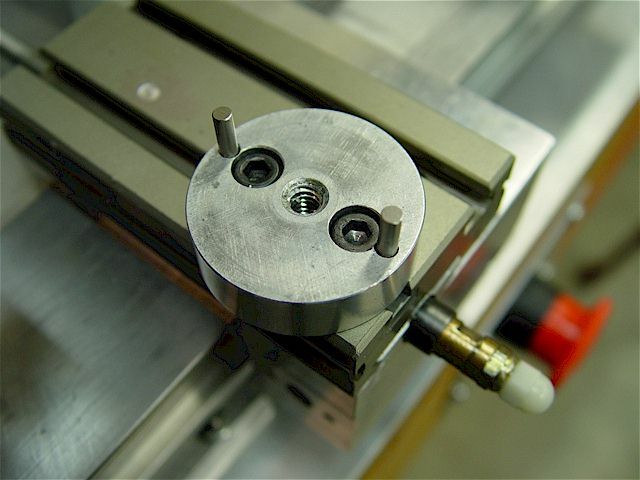 A threaded hole allows a 4-40 screw with a SS washer to hold the module in place. Brackets installed. 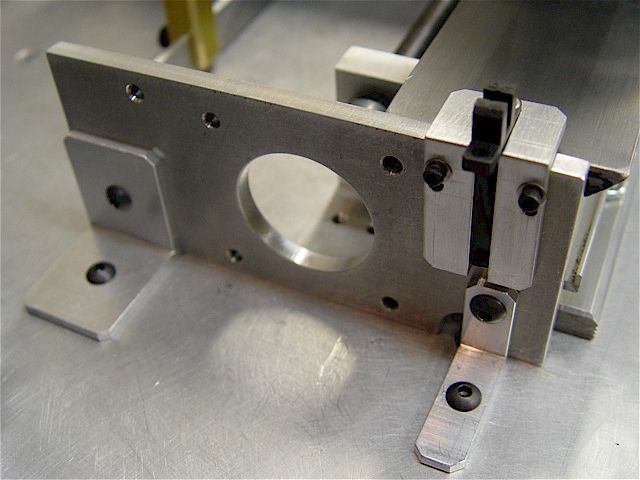 Upper holes of the L-brackets are slotted to allow final motor & lead screw axial alignment. tightening. 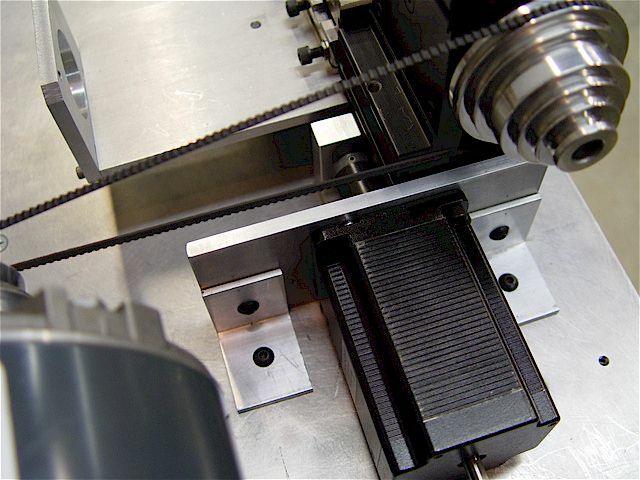 This method is also used to align all axes of the mill & lathe DRO scales/brackets. The module bracket was moved to a position that allowed the disk to be slid into place through the large notch. 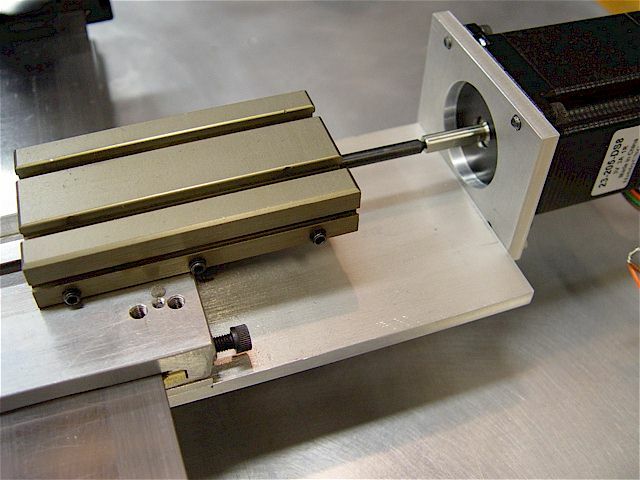 To center the disk in the slot, the spindle was adjusted along the dove-tail bed. The module bracket was then adjusted up to the correct position. 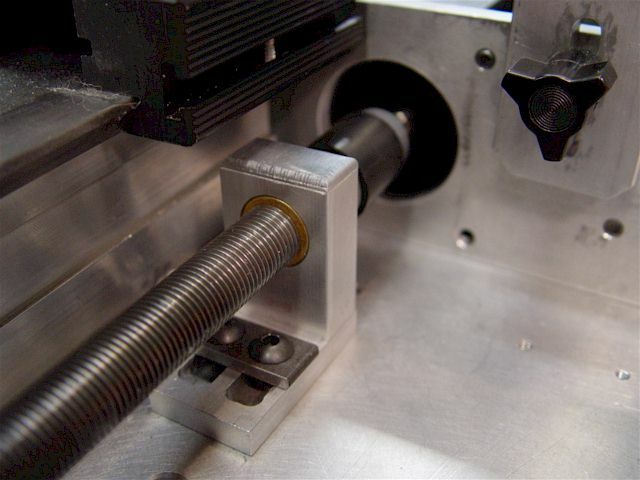 Slotted bracket bolt holes (middle) allowed the final alignment of the stepper motor shaft to the lead screw. 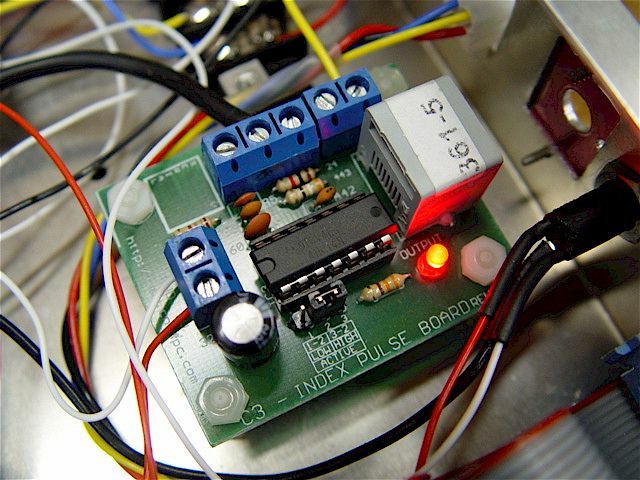 The E-O sensor module is connected to an index pulse board & interfaced with the system breakout board. 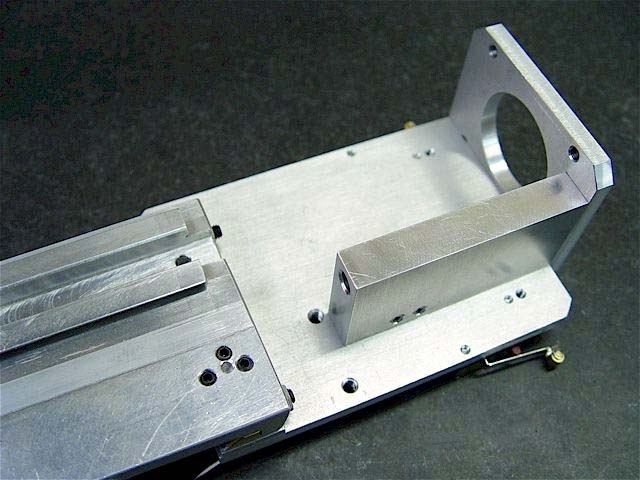 X-axis limit switch mechanism. 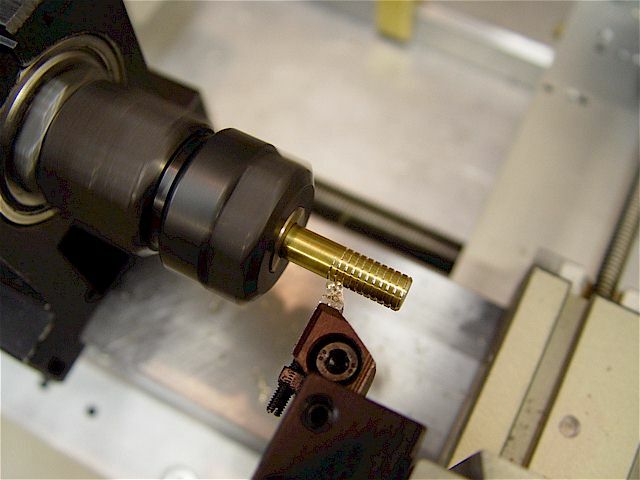 A 1/4" brass rod forms a cam against a micro-switch held inside the bracket. The rod smoothly slides in a precision-reamed hole; a very close fit. 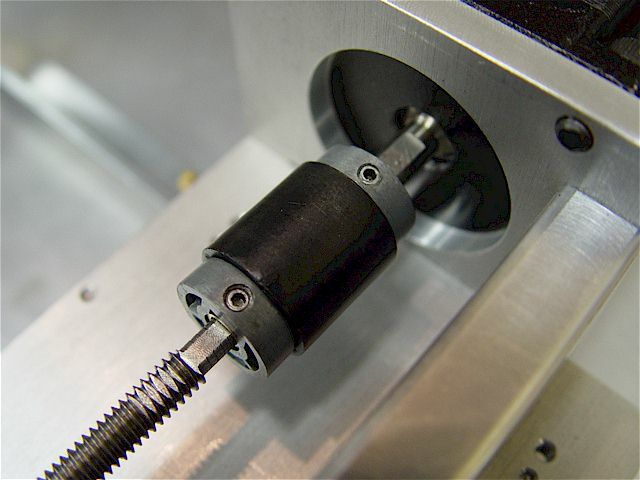 A round cam actuator is easier to make as it has no precise orientation with respect to the switch. 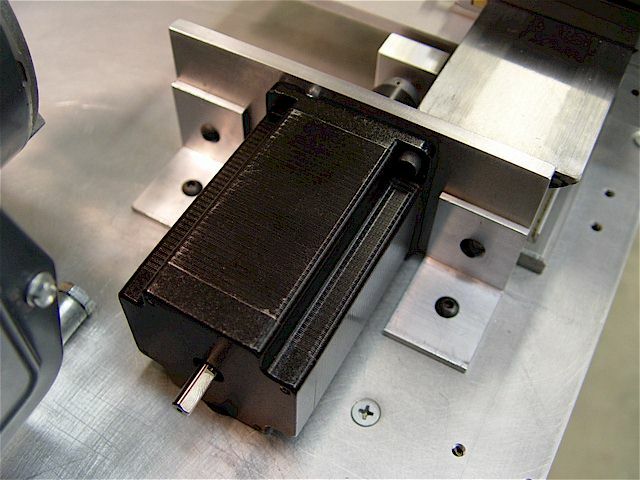 The limit switch housing also acts as a massive stiffening bracket. 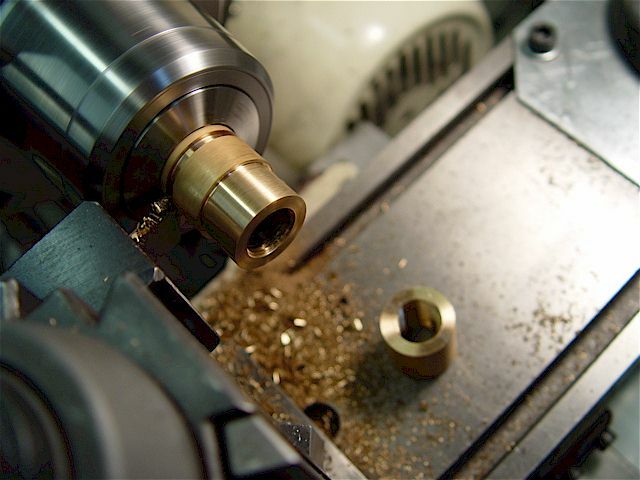 Detail of the brass rod cam. Note the two cams are at the front & back. 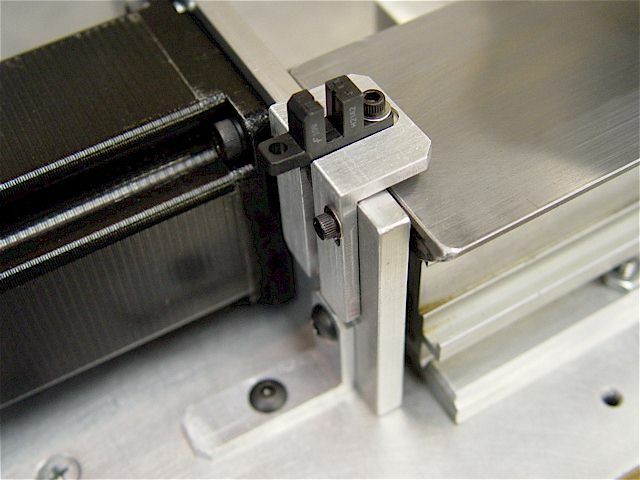 The cam attaches into the cross slide's right-side T-slot. 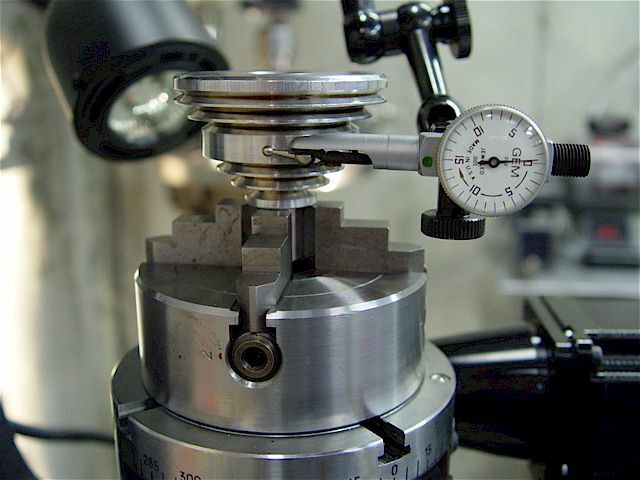 which might happen under special operating conditions e.g., using a rear cutoff tool post. A pocket was milled into the bottom of the bracket. 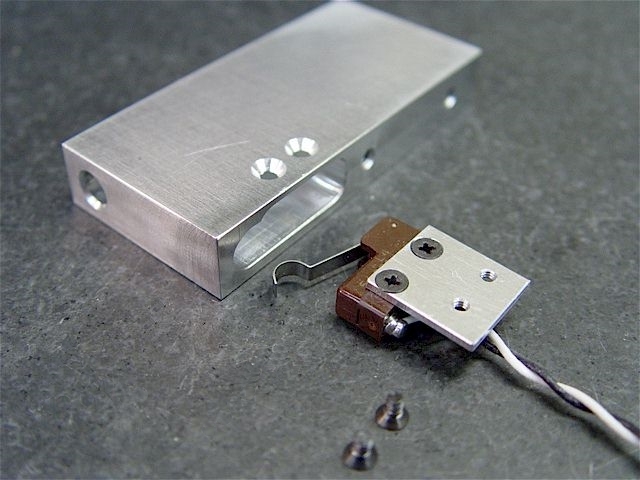 The micro-switch is held by a sub-plate. 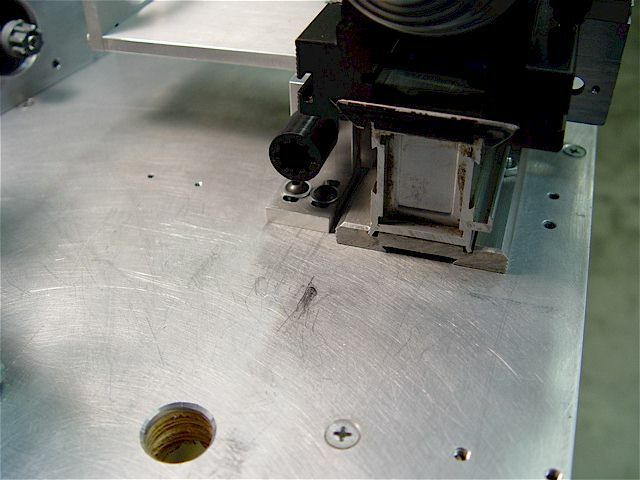 The two plastic switch mounting holes were tapped to 3-48 as was the plate. 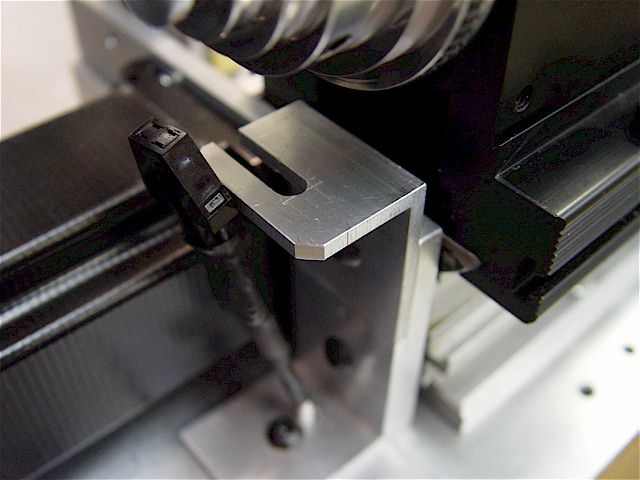 The top of the switch mounts against the bottom of the milled pocket. 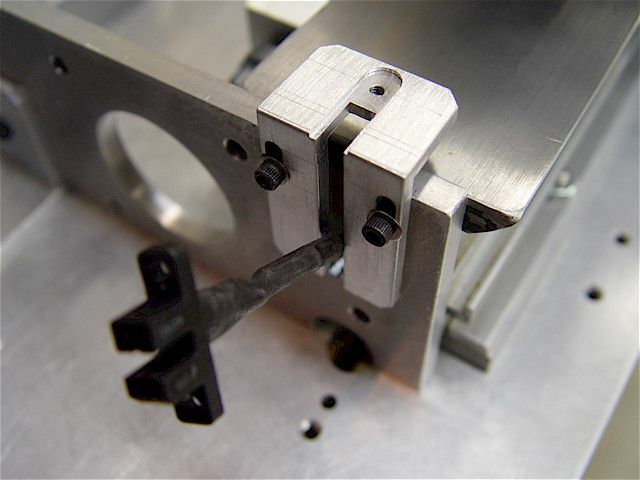 Only the hump on the switch lever projects through an elongated, 1/4" hole perpendicular to the cam guide. 0.050" travel is needed to open the normally closed switch. 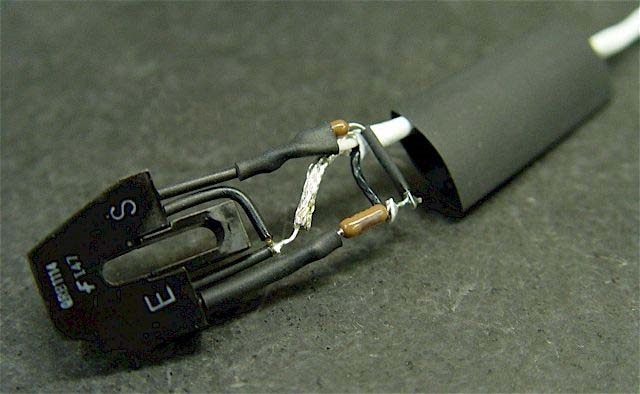 Teflon-coated wire is used for the connections. The side of the pocket was relieved to make room for the 0.0625" thick switch plate. 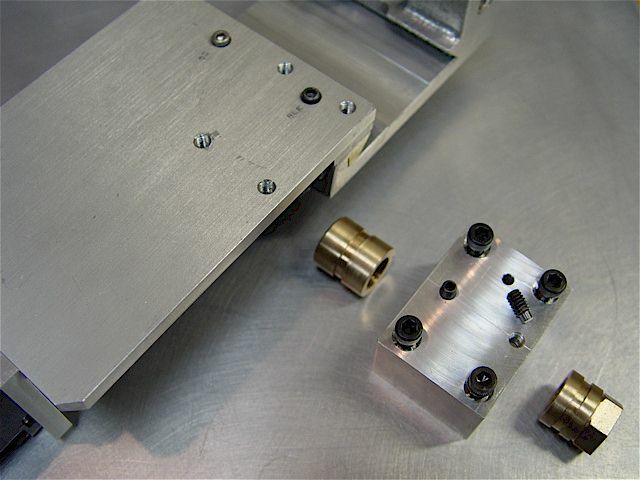 The Z-axis limit switches are mounted underneath the motor bracket to protect them from swarf. 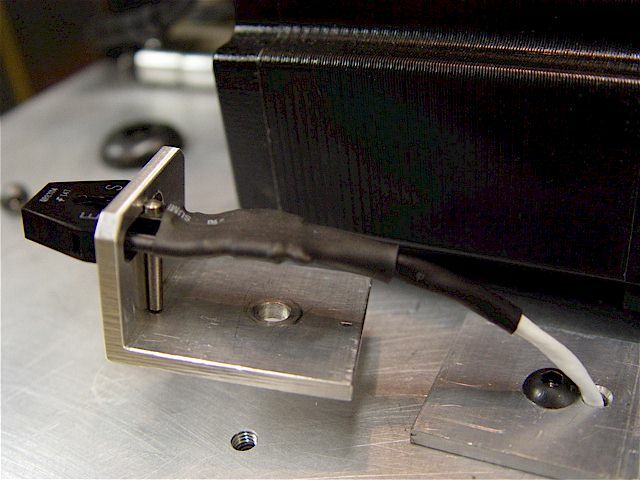 The 2-conductor Molex receptacle edge sits in a small pocket & is captured by a clamp. 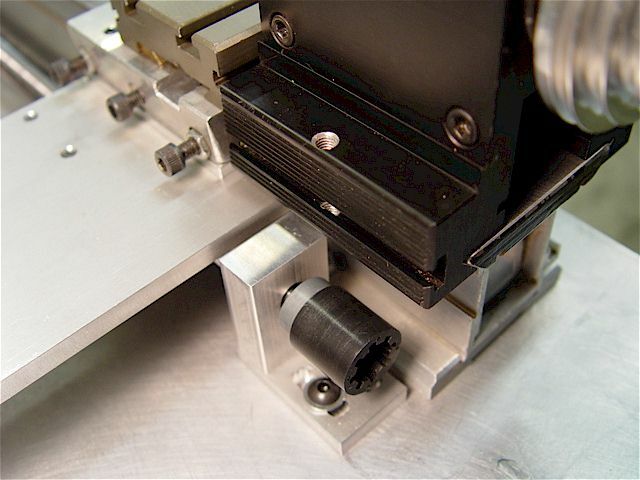 This connector allows the stepper motor & limit circuits to be separated from the bracket. Molex receptacle captured by the clamp. 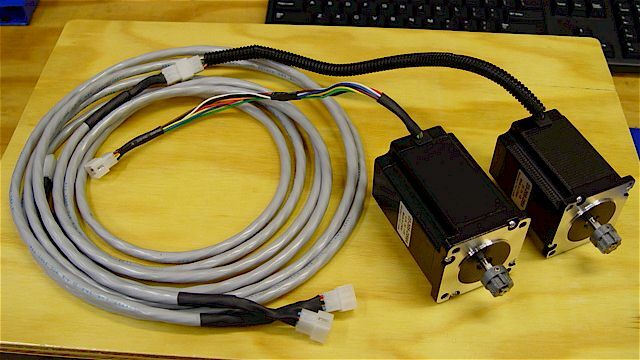 The three NC switches are serially connected to the Molex receptacle using Teflon-insulated wire. Made the receptacle clamp smaller & moved the limit switches further under the bracket for more protection. 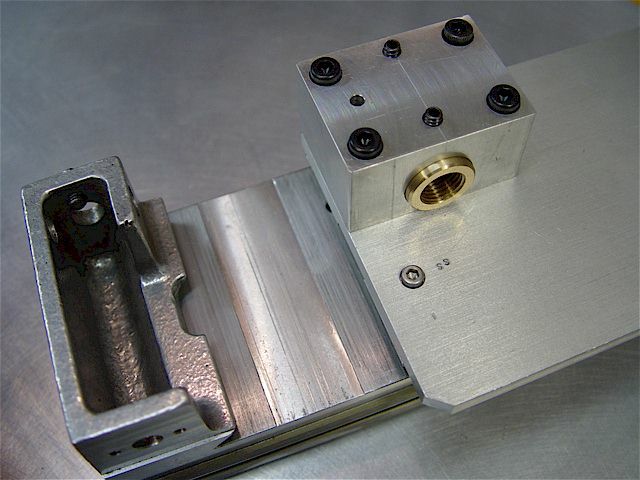 Adjustable, brass, Z-axis limit-switch stops. The brass stops clamp onto an L-bracket. 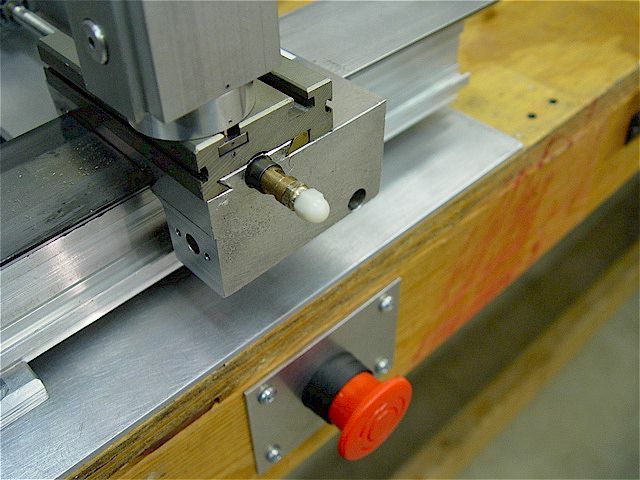 A 6-32 thumb screw secures the stop at any point on the rail. The slot is a close fit to the rail. All limit stop edges were radius. 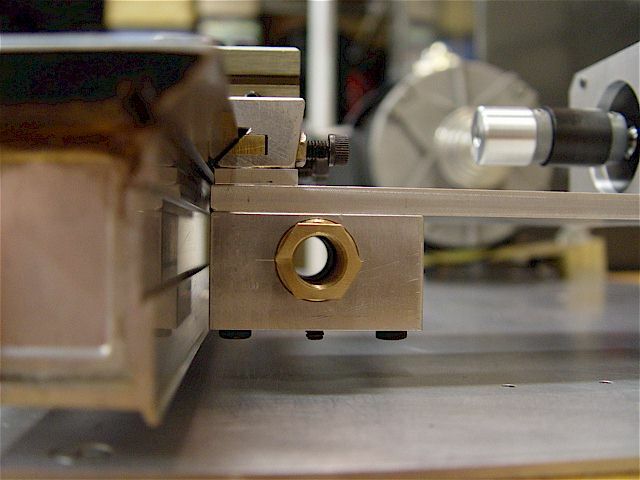 A precision steel scale was attached using thin, double-sided tape. First degrease all contact surfaces with isopropyl alcohol (C3H8O). Limit switch cable connected to breakout board circuit. 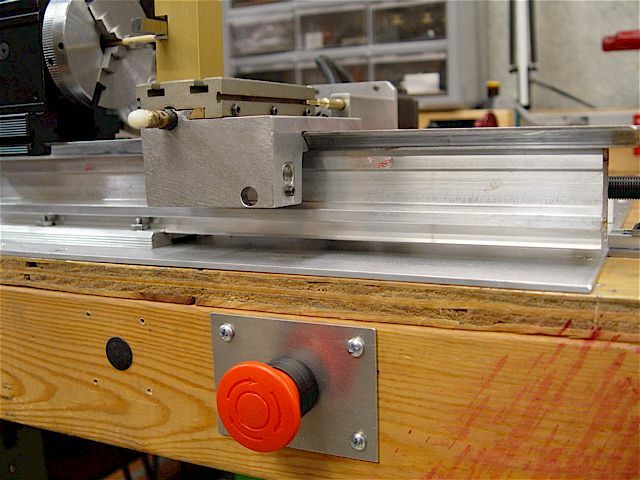 Limit switches & stepper motor cables are sheathed & then routed under the bench. NC for operation of either machine. The length of the bench now has 5 E-stops (including the keyboard ESC). dowels were installed to align the base. 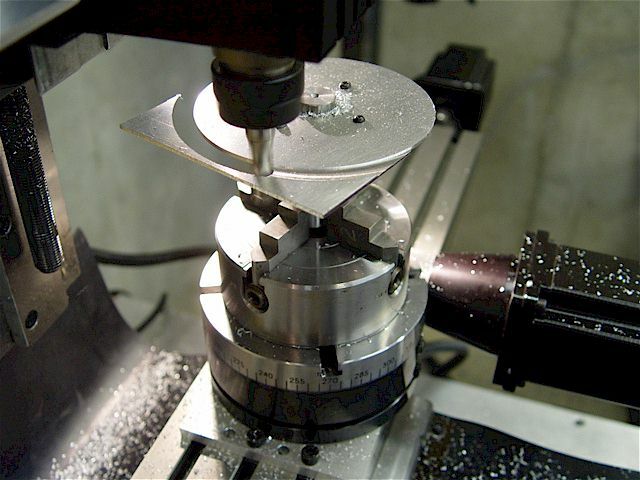 The pilot hole is shown being drilled 7/64" before reaming to 1/8". 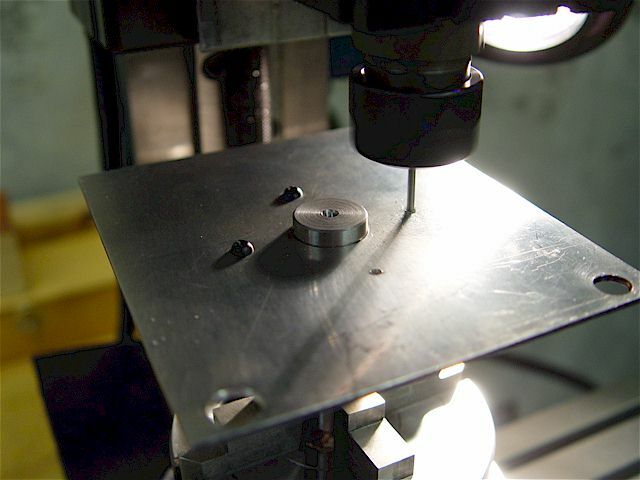 Before drilling, the T-nut & QCTP base were aligned by placing on a surface plate & using a surface gage. 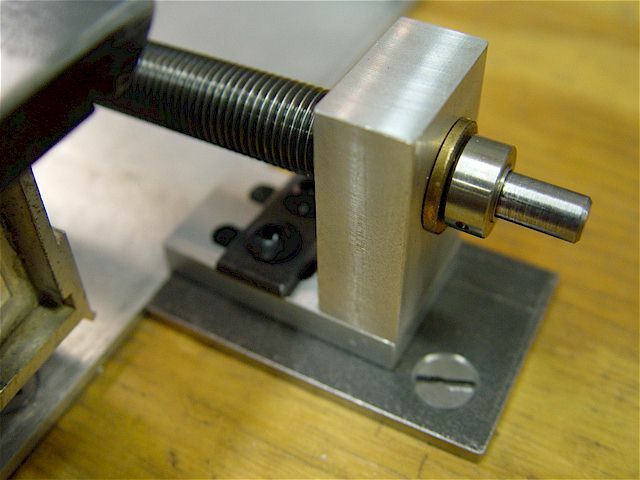 The 1/8" dowels align the QCTP base & the steel T-slot nut to the blind holes in the cross slide. 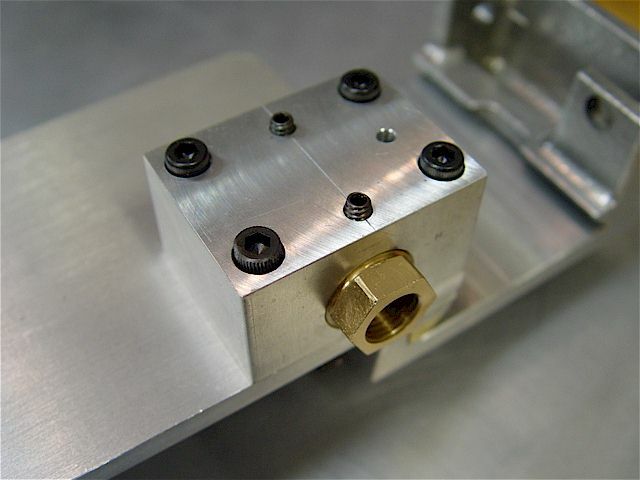 Note the alignment holes in the QCTP base. They can be easily removed if the QCTP needs to be rotated. All pieces assembled & locked onto the cross slide. 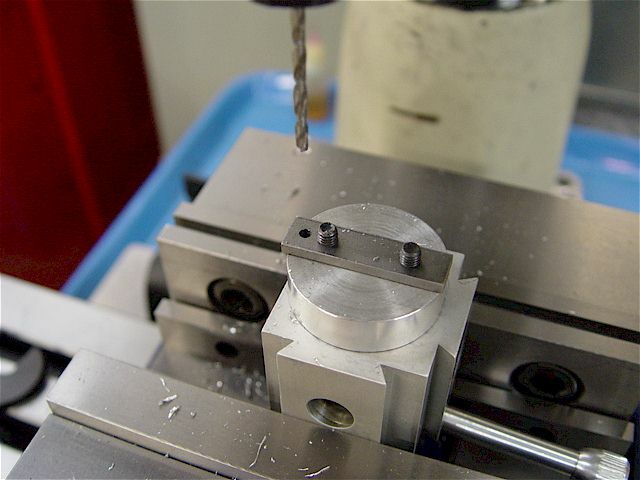 The Taig CNC lathe making a test finishing cut. 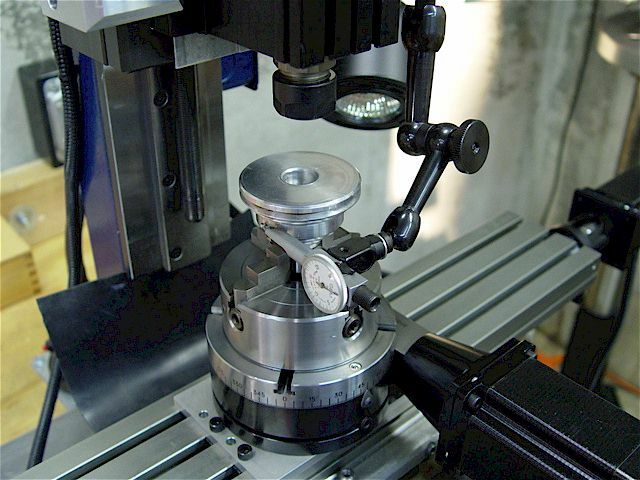 Mach3 Mill also contains Mach3 Turn to control your CNC lathe motion. 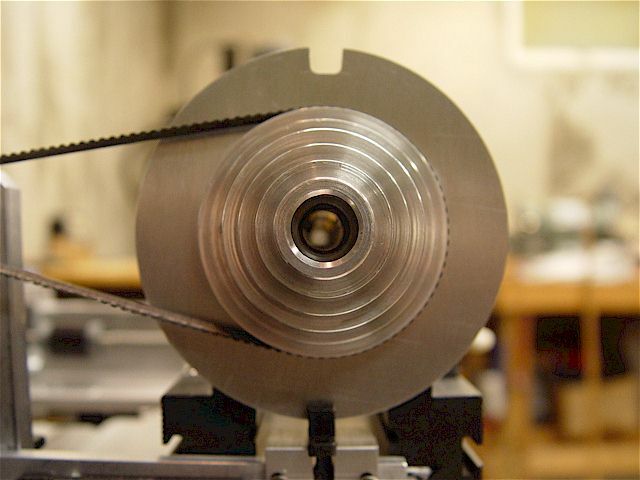 Lathe making a 0.3" OD hemispherical cut. 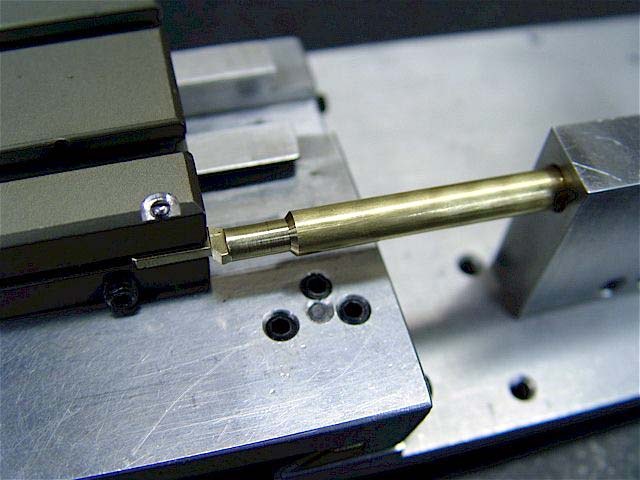 The rod is held using the Taig ER-16 collet adapter. 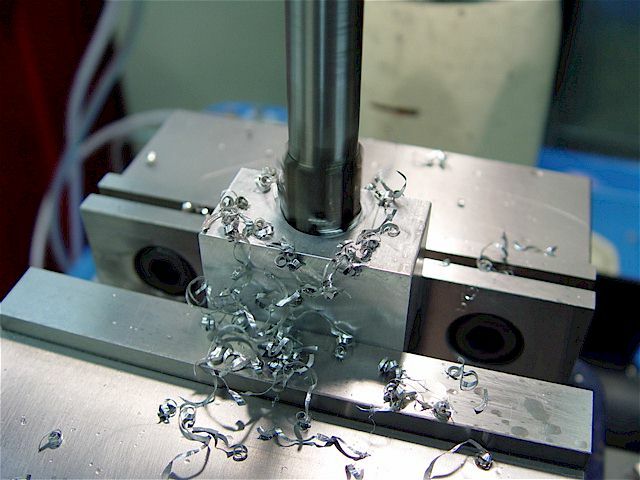 Two movies showing a Taig CNC lathe threading a 3/8-16 aluminum bolt. 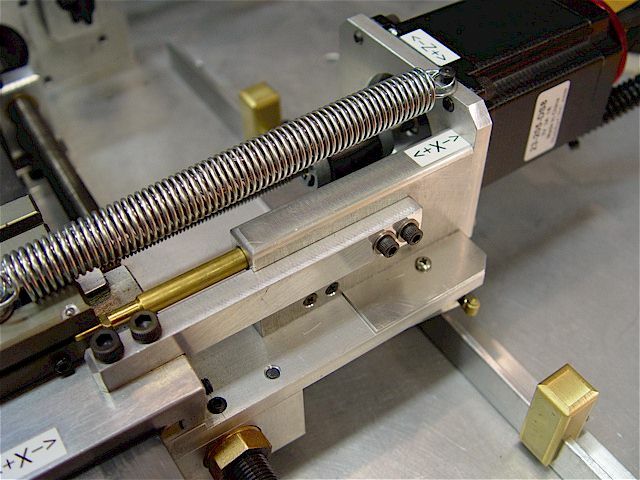 In Mach3, the spindle must be turned on (yellow LED illuminated) for the program to read the spindle rotation. Spindle speed averaging is also recommended. 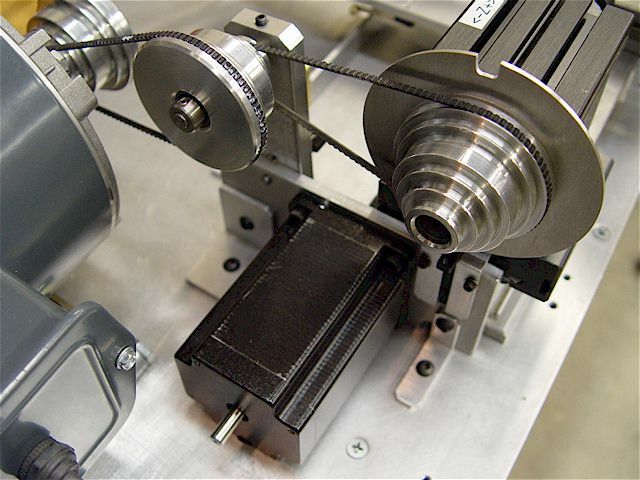 See the Mach3 threading setup manual. 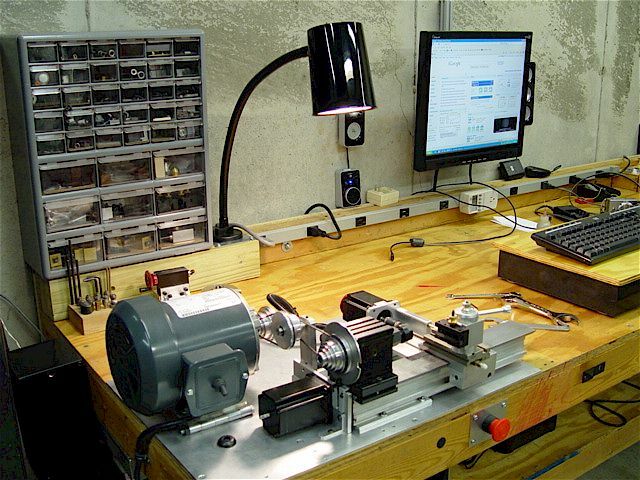 An upgraded task/machine work light (USA) for the CNC micro-lathe setup. It uses up to a 100W (maximum) halogen or incandescent lamp. Magnetic base. 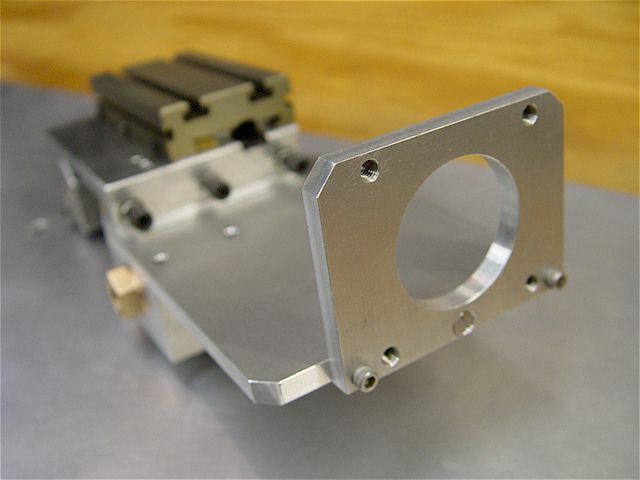 Replaced the magnetic base with a 1/4-20 tapped, 1/4" thick aluminum base plate for high rigidity.